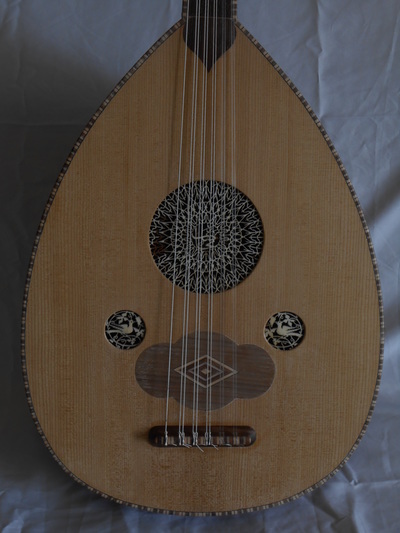 Abdo George Nahat was originally known for his partnership with his brother (Roufan) under the "Ikhwan" label. 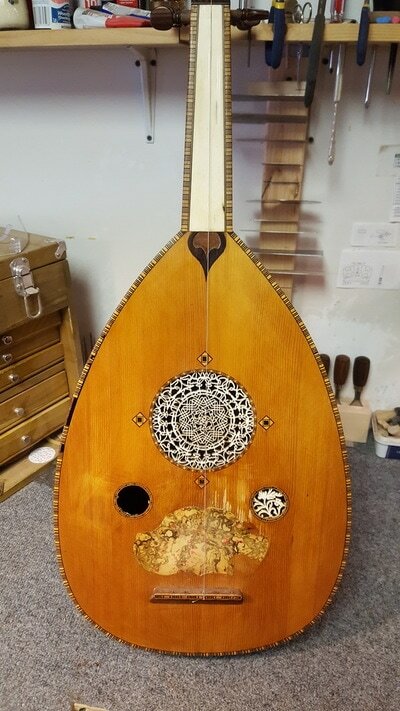 Later he began making instruments using his own label. 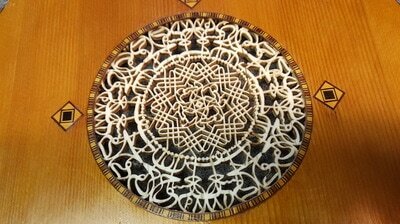 His work displayed a great variety of diversity. 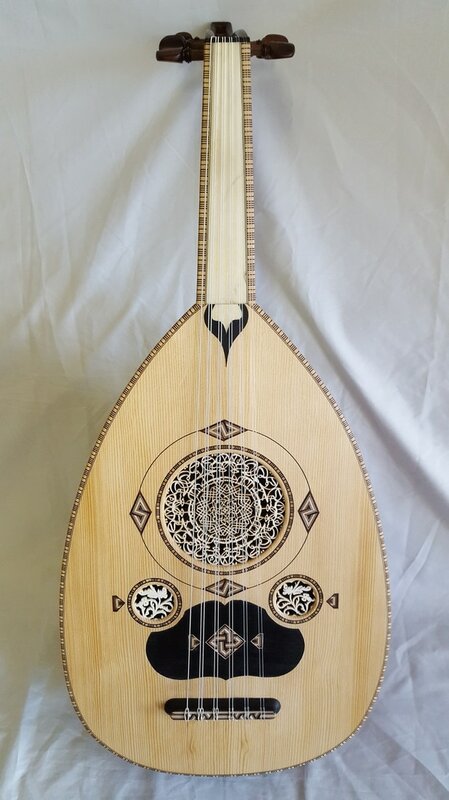 Some of his ouds were very simple yet elegant, while others radically virtuosic demonstrating a level of mastery and imagination that has never been seen since. 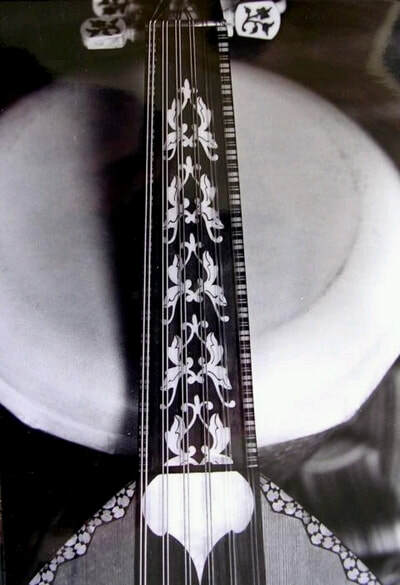 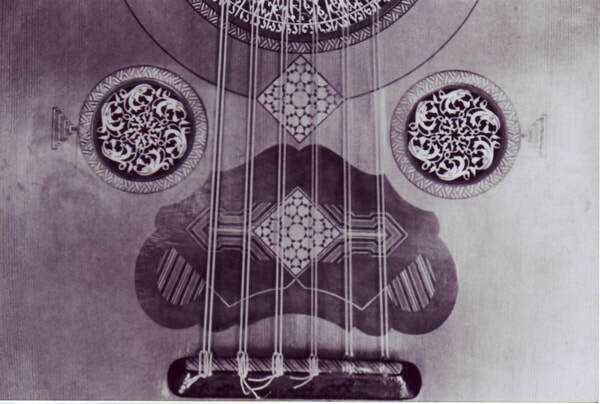 One such exemplary instrument Abdo made in 1910 was made famous by player Hamza Al Din and demonstrates remarkable workmanship and artistry. 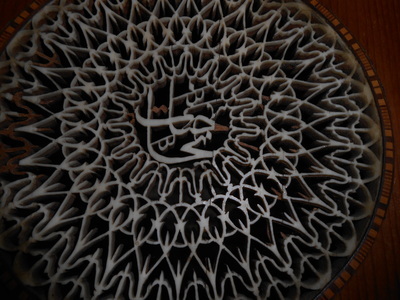 Very delicate inlays, mosaics, one of the most intricately carved rosettes that we know of not to mention one of the most incredible sounds we ever heard. This oud really had it all. 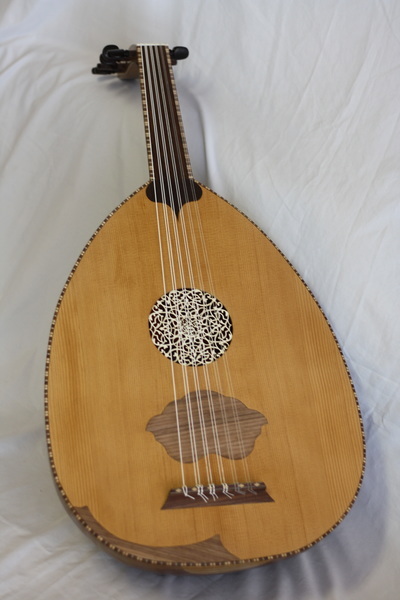 The oud that came to Lord of the Strings however is more of the "simple yet elegant" type, yet still very beautiful. In fact many people prefer these kind of instruments over the more ornate kinds. 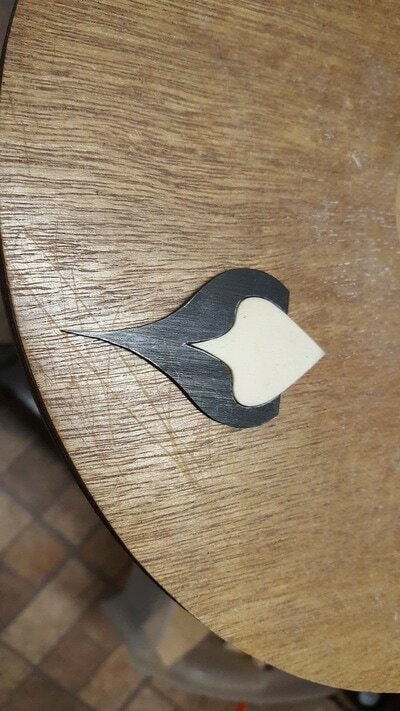 It arrived to me in a sorry shape. 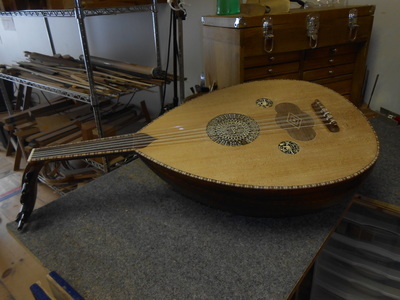 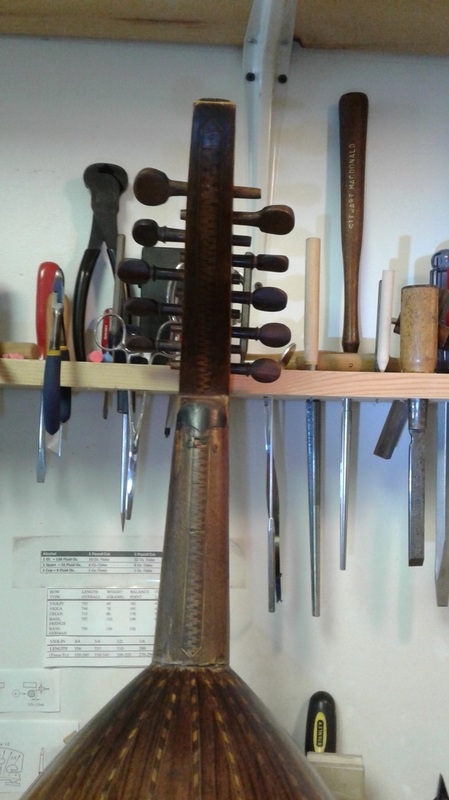 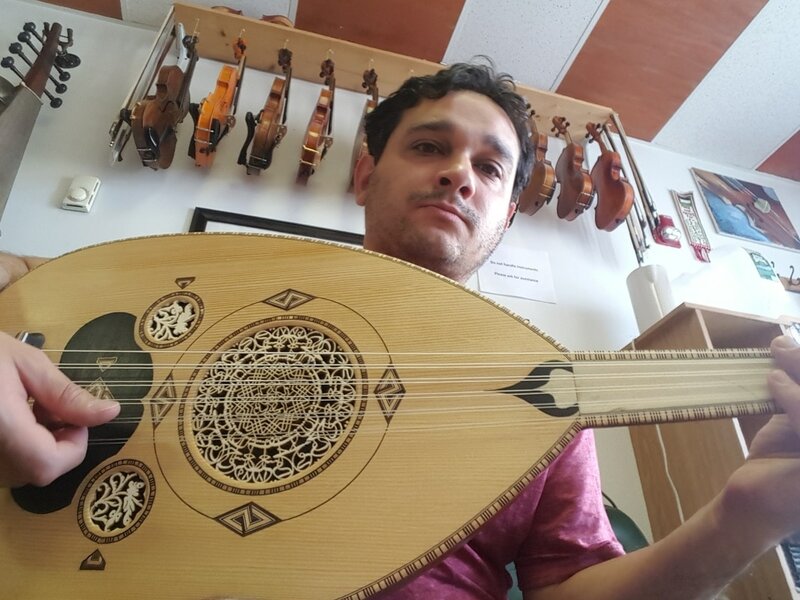 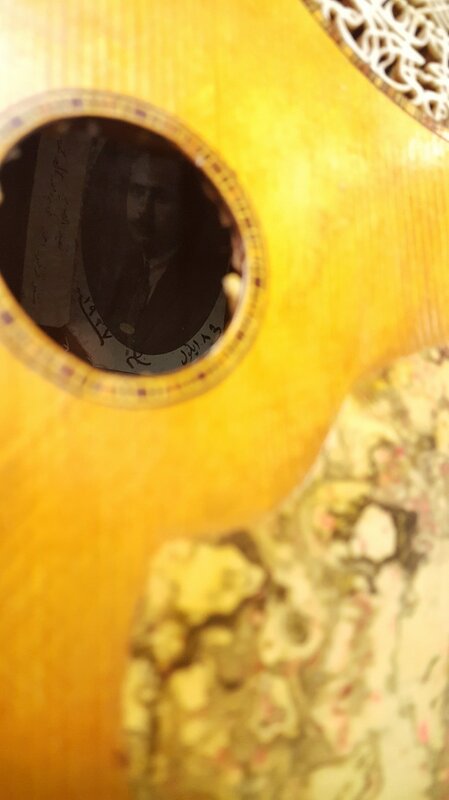 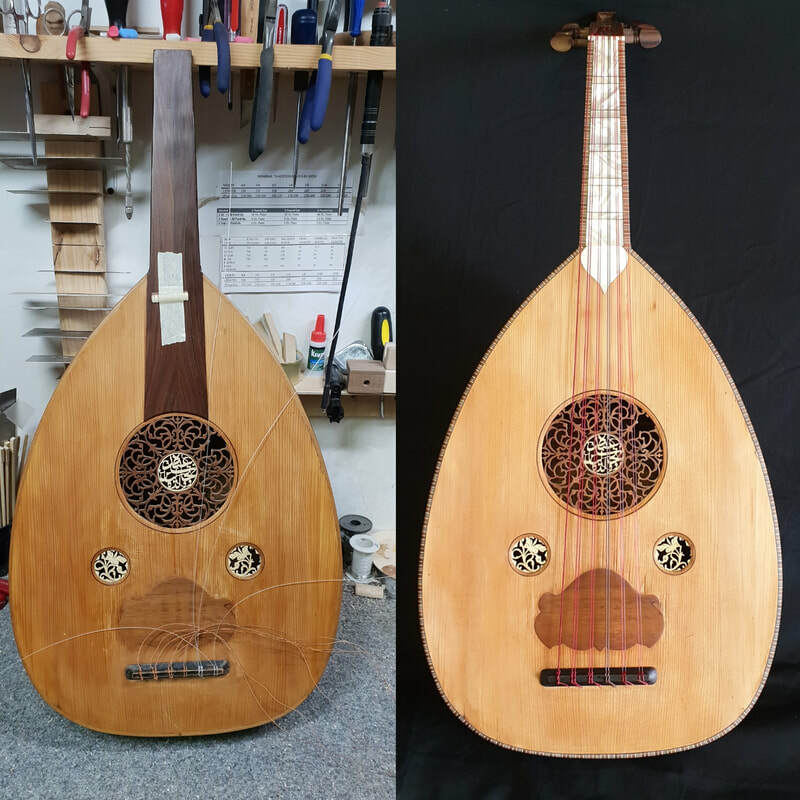 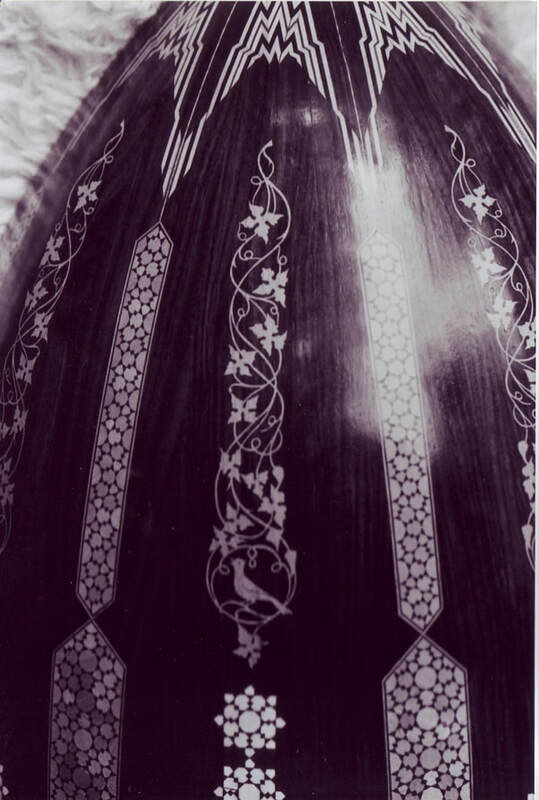 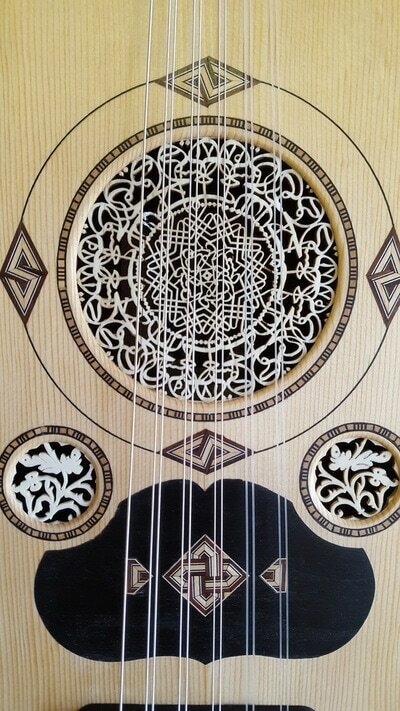 ​Yet another astounding oud made by Toufik Nahat in 1928 recently received an extensive restoration here at my workshop. 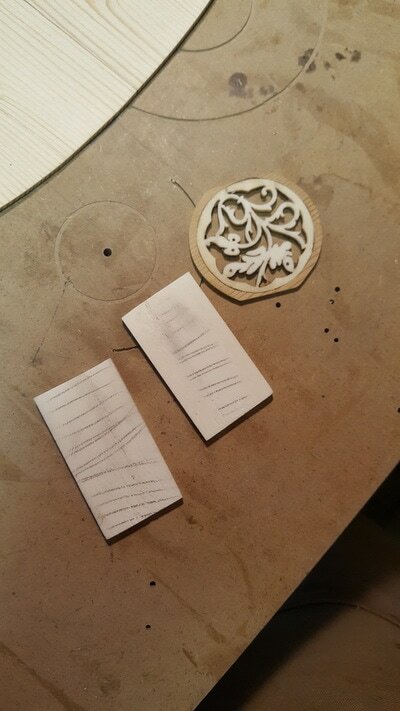 Exhibiting some of the classic motifs and ornamentation we'd expect to see on a classic Nahat. 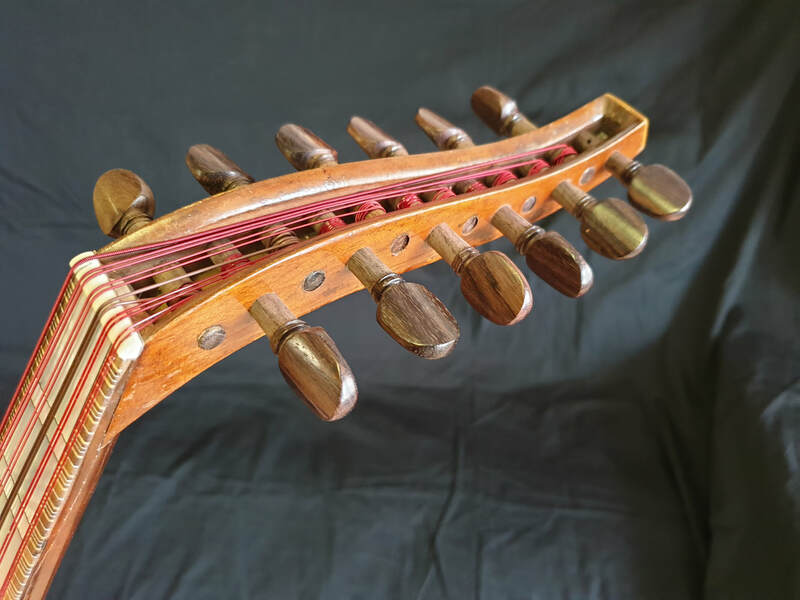 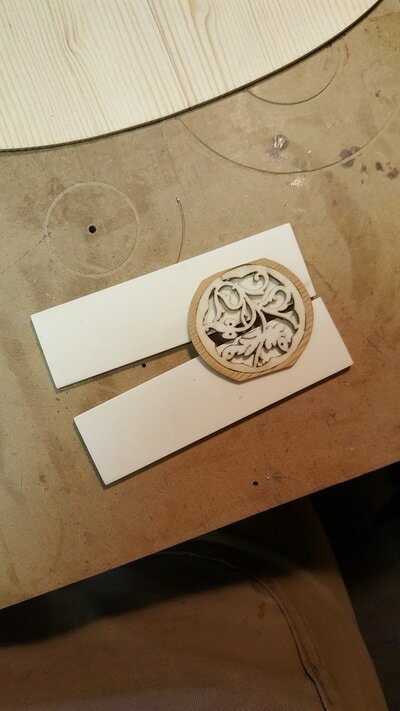 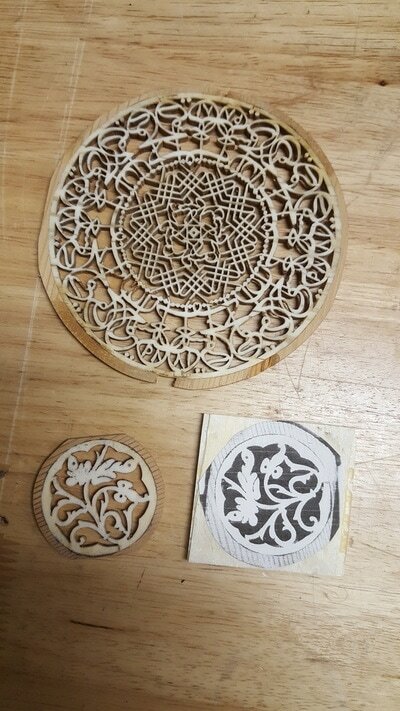 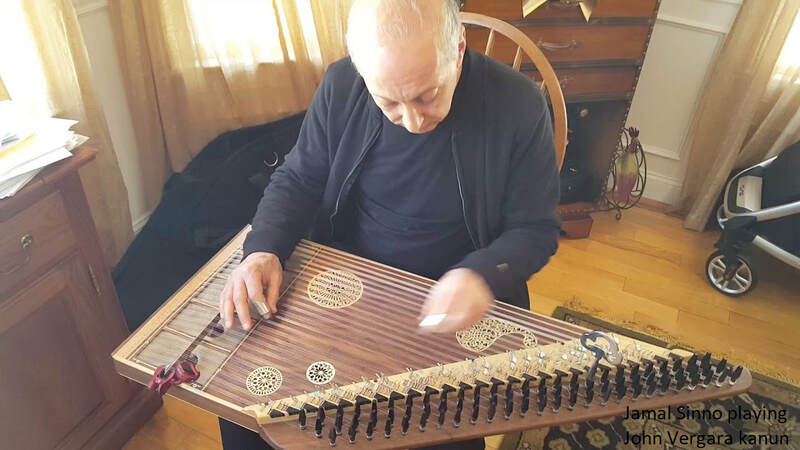 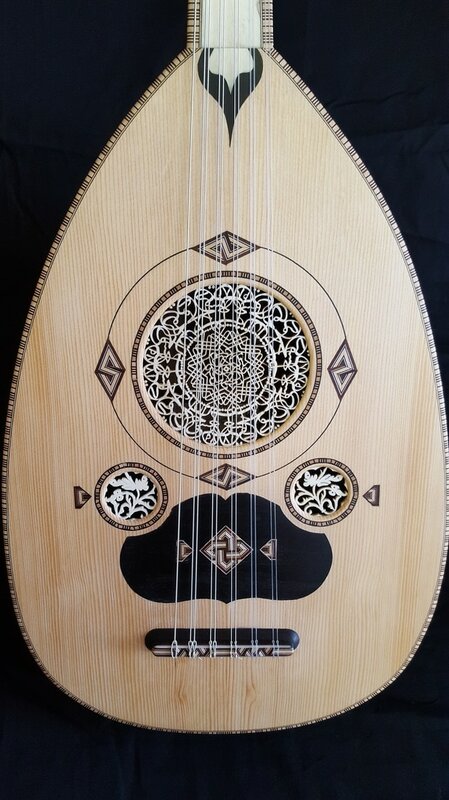 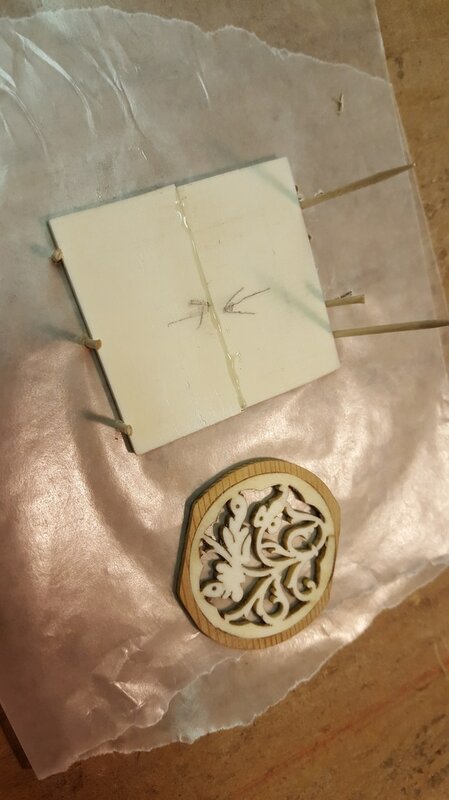 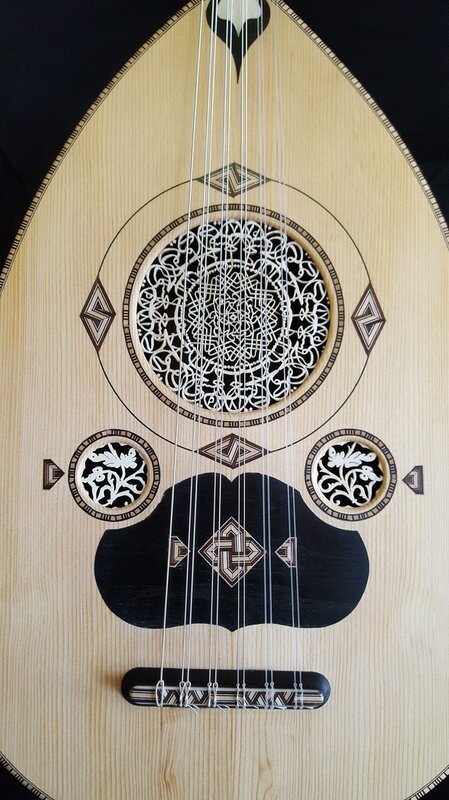 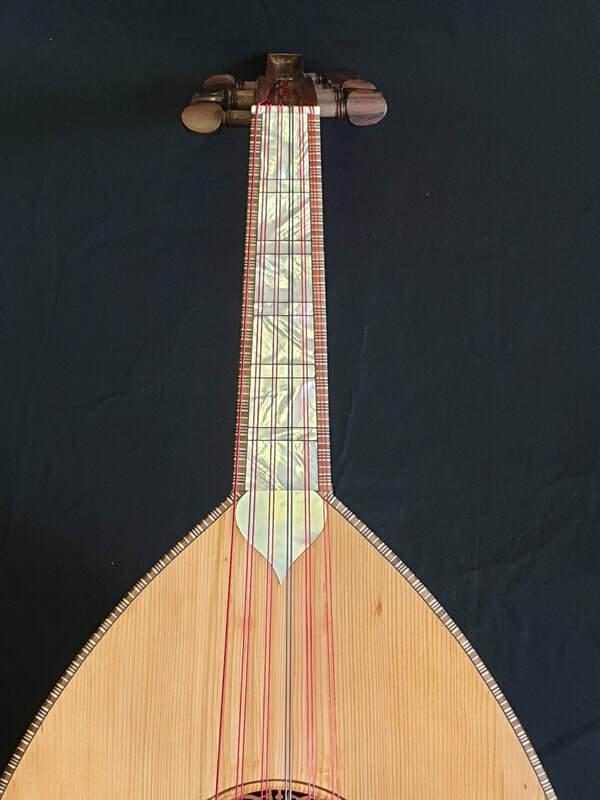 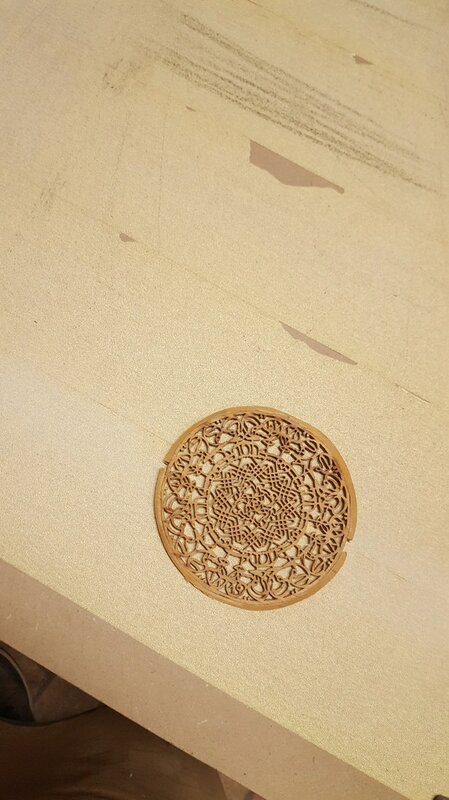 (Please read my previous blog post to learn more about Nahat ouds) Hand carved bone rosettes, mother of pearl for the fingerboard, beautiful mosaic/marquetry pattern on the soundboard, bowl and neck, and of course that famed sound of an old Damascene oud. 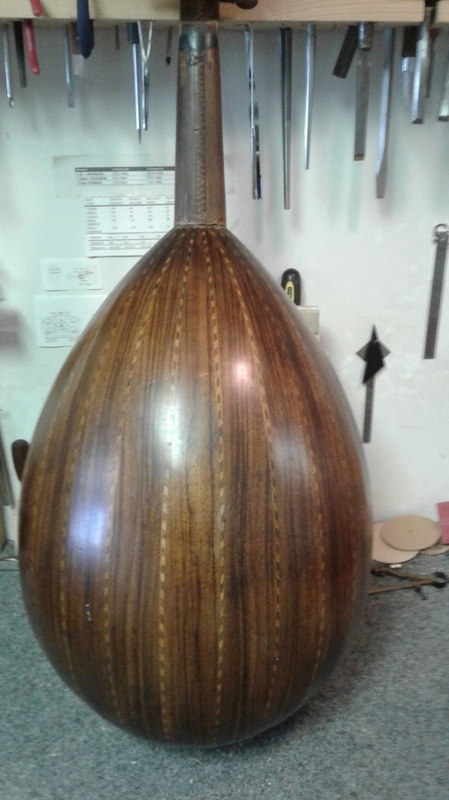 This was a very extensive restoration project as many difficult challenges arose and dragged out extensively over the period of a few months. 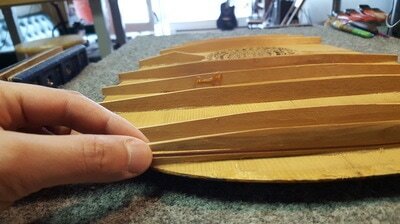 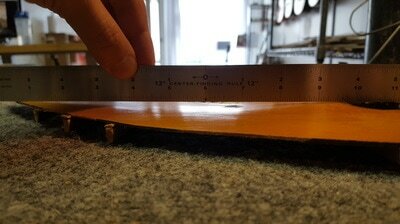 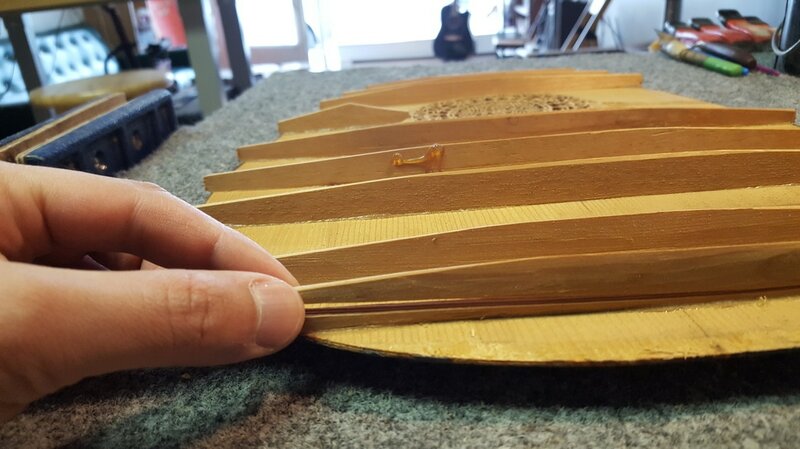 To repair the many cracks on the soundboard, it needed to be removed which is a very risky and invasive operation since the instrument is 90 years of age and the soundboard in some places is only one millimeter thick! I would also correct the loose neck and really high action in this stage. 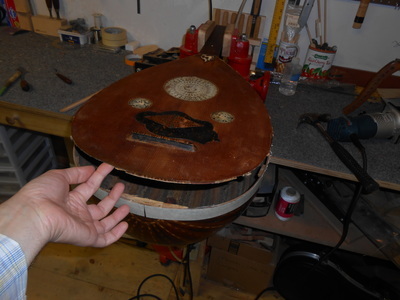 A brace inside was also replaced, along with repairing some loose braces; a very critical necessary task for the instrument's structural integrity. The mosaic binding was copied to the 10th of a millimeter and replaced when the soundboard was reinstalled to keep everything as original as possible. Unfortunately this treasure was repaired previously by an ameteur, causing some damage to the soundboard and to the rosettes. 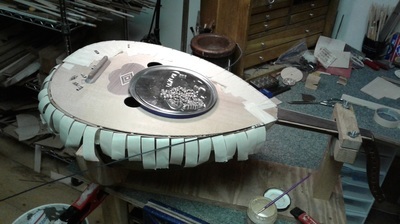 After installing the soundboard back there was a very obnoxious buzzing sound coming from the rosette once I put the strings on it and tested it extensively. 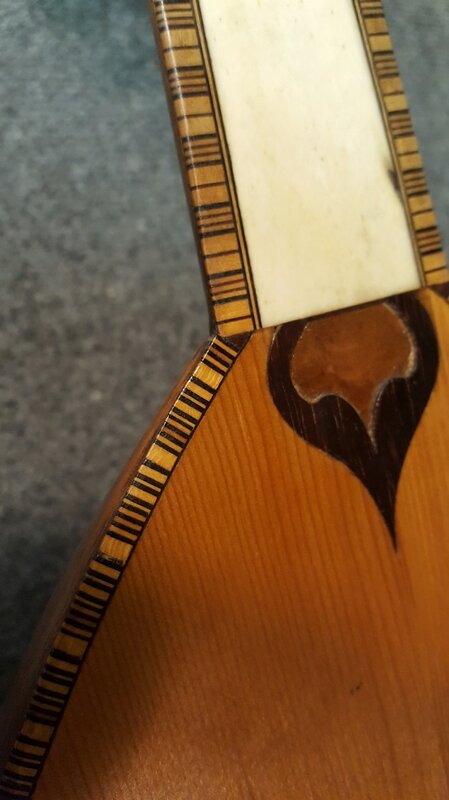 This is often the problem with these older instruments with Bone rosettes. 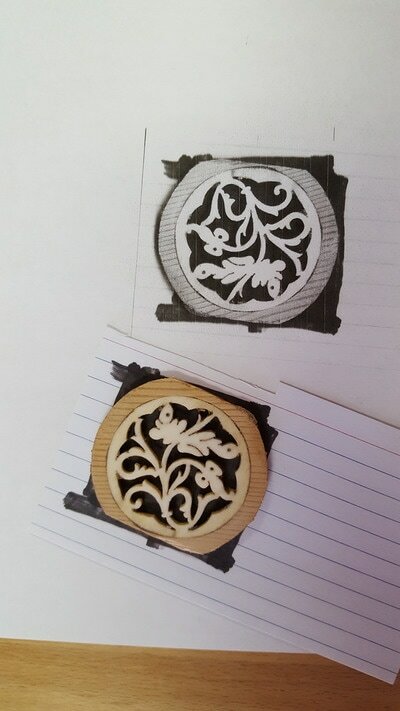 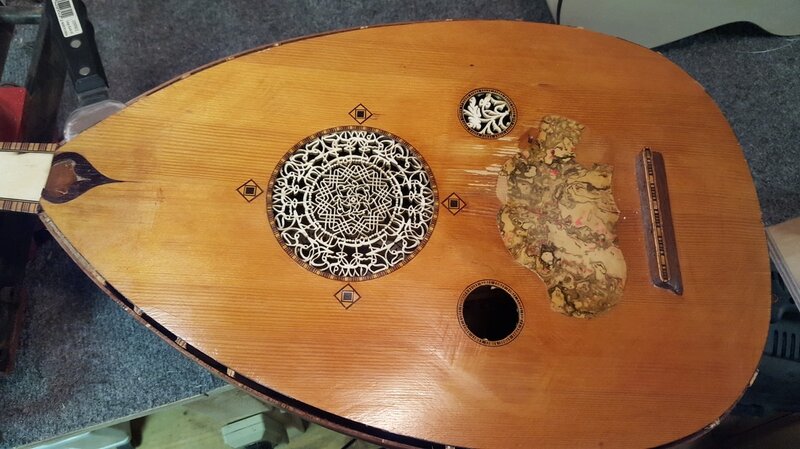 The main rosette and the small one were "repaired" previously using white plastic pieces, and white out, and weren't contacting the soundboard. 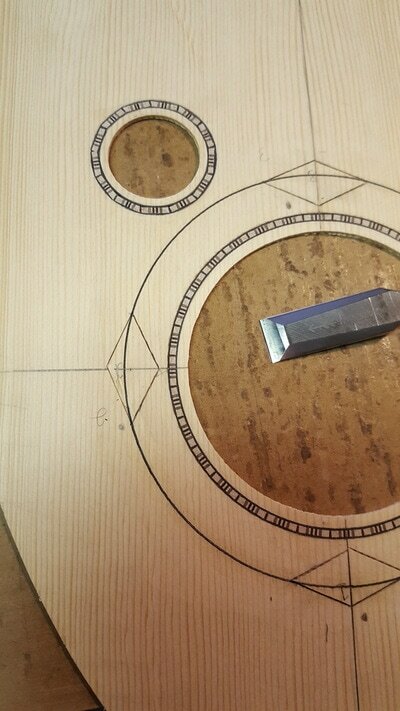 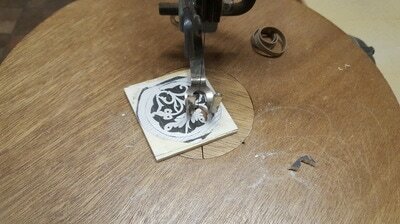 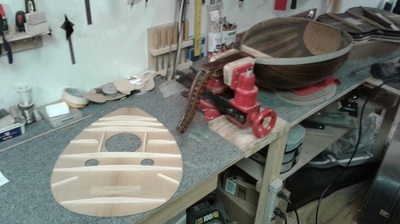 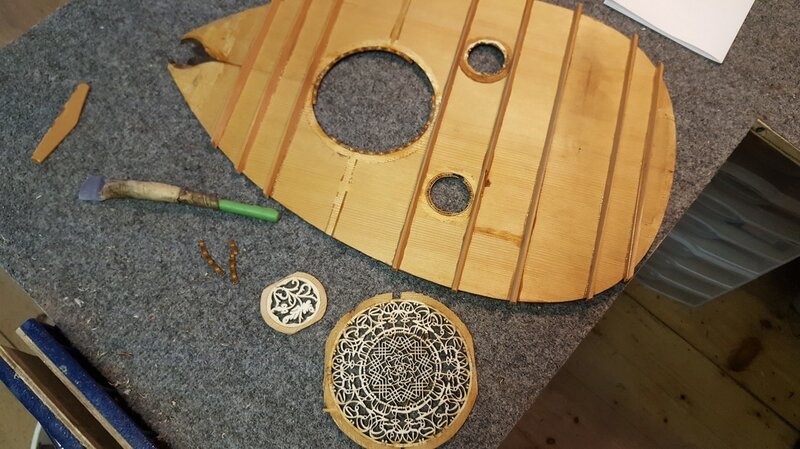 A lot of the mosaic pieces around the soundhole needed to be replaced as well. The original small bone asfour (bird) rosettes was replaced altogether with a new hand carved one due to damage and the precious bad repair. 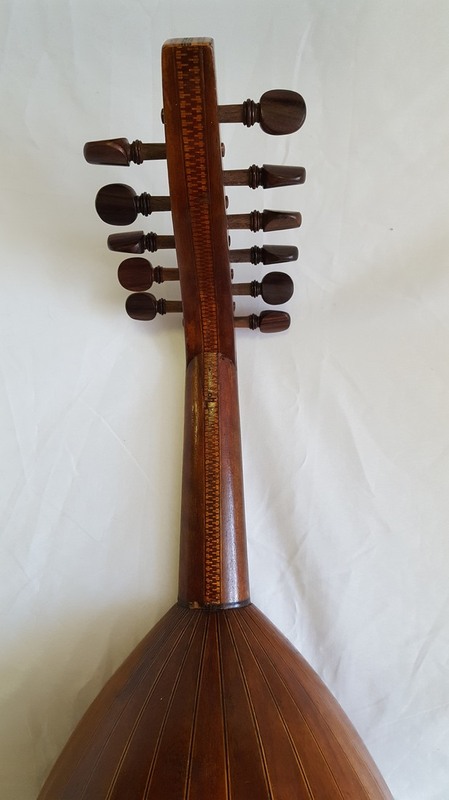 All in all I'd have to say that this particular instrument is quite remarkable in that apart from the damage to the rosettes over time, unprofessional repair work and some other issues, it is incredibly well preserved. For example, the finish on the bowl and neck still appears vivacious as if Toufik himself just applied the final coats of finish last week. 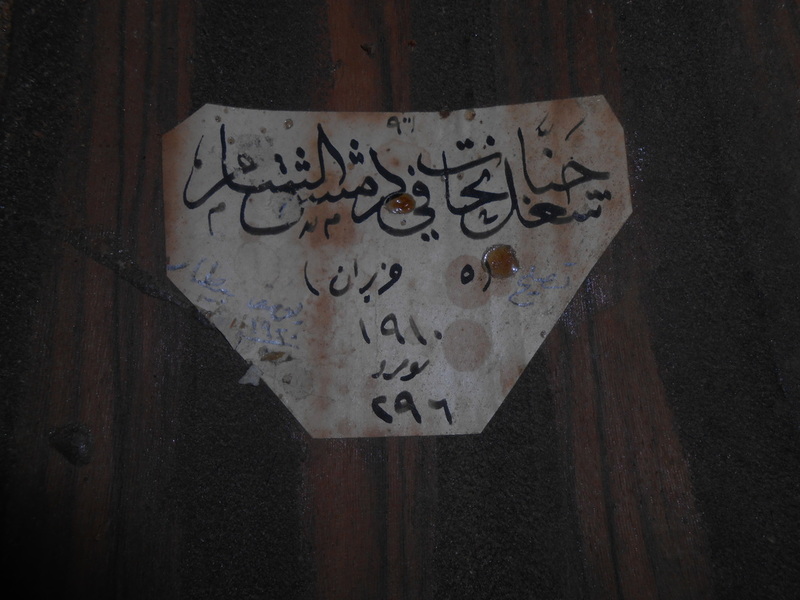 Damascus, Syria. 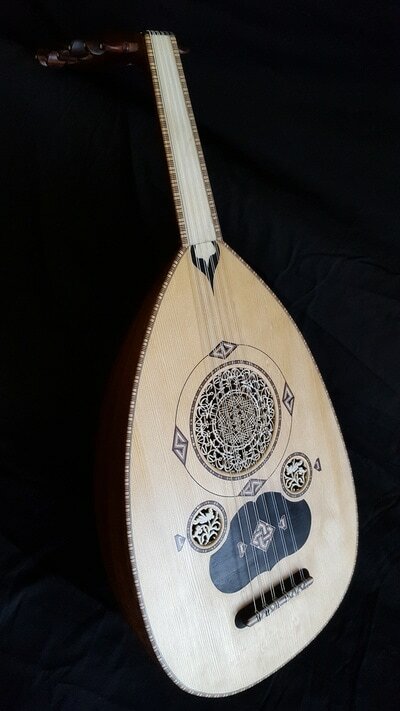 Arguably the epicenter of the oud. The most significant makers hail from this important city of the Arab world. 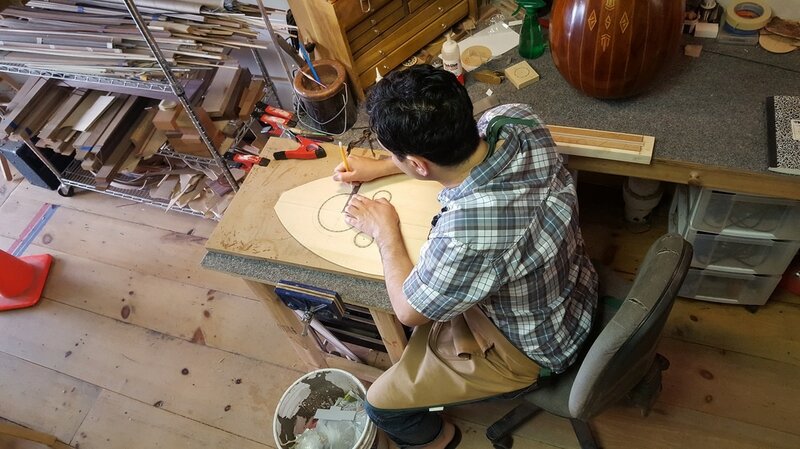 Nahat isn't a single maker, but a family dynasty starting with Abdo Nahat in the 1830's and ending with Elias Nahat as late as the 1980's in Brazil. 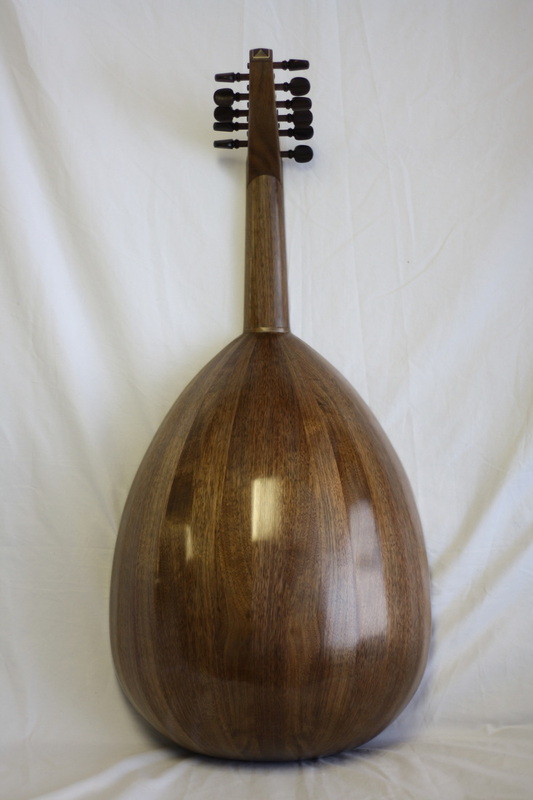 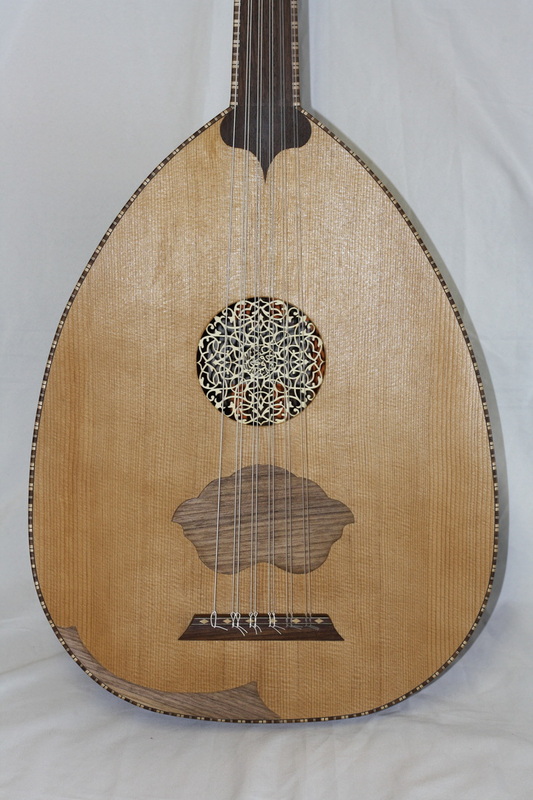 Nahat ouds are regarded as the best and are highly sought after. The craftsmanship and rarity play a part in this. 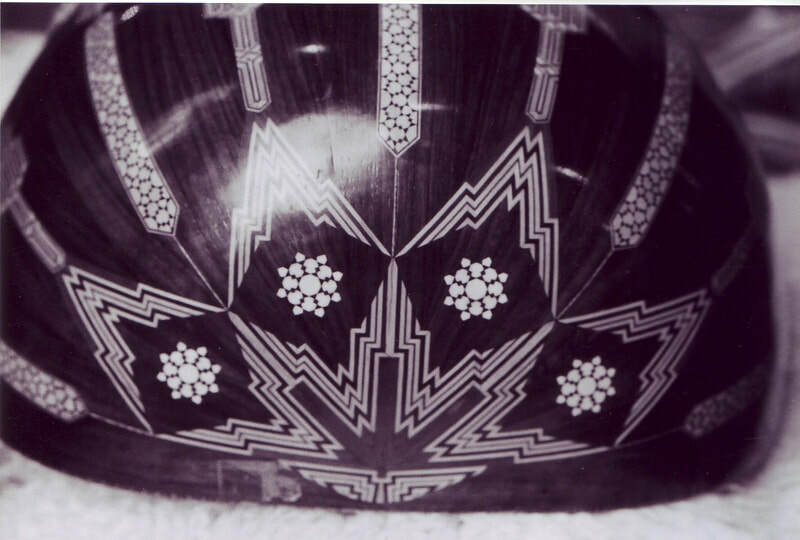 The Nahats are important because they established what would be defined as a classic Damascene oud. 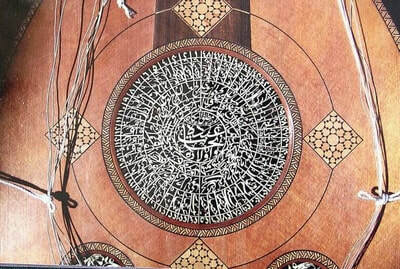 The dimensions, shapes, patterns, motif/marquetry designs, and of course the "true Arabic sound". 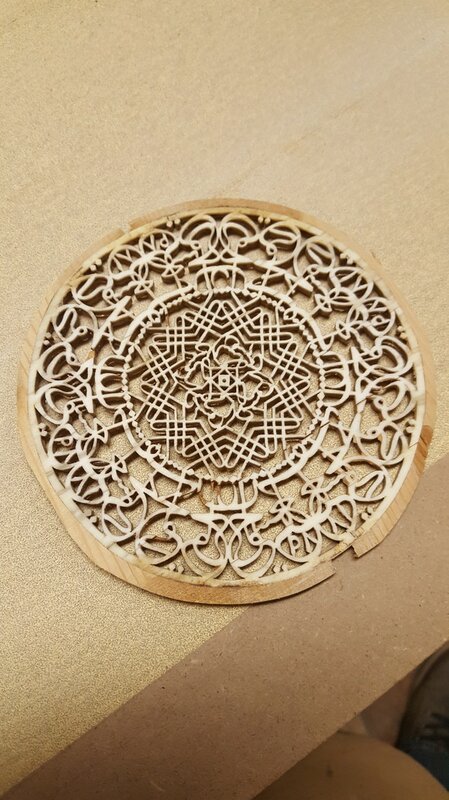 The very word "Nahat" means carpentry or wood worker in Arabic, which most likely implies a family trade that could span a number of generations. 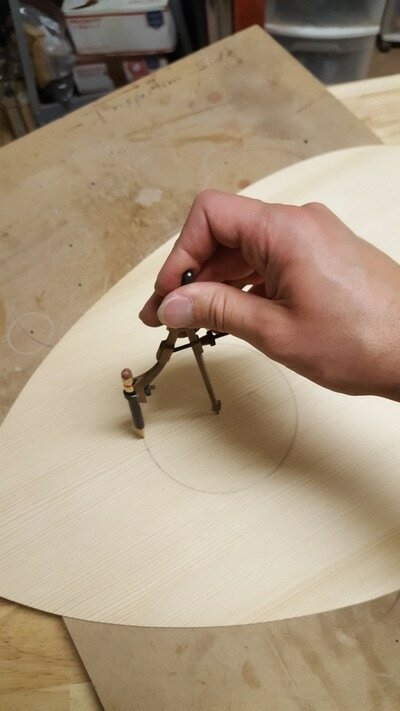 We know they made furniture as a primary occupation. Their oud labels read "atelier de menuiserie" in French, or "carpentry shop" in English followed by "quality furniture at discount prices." Some of their ouds are lovingly embellished with mosaic inlays similar to the ones in their furniture. 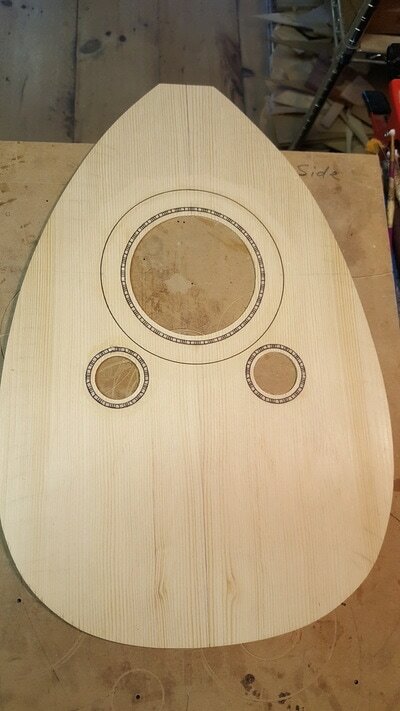 The geometries used to shape the bowl and soundboard demonstrate an advanced understanding of mathematics and it's role in optimizing acoustic output. 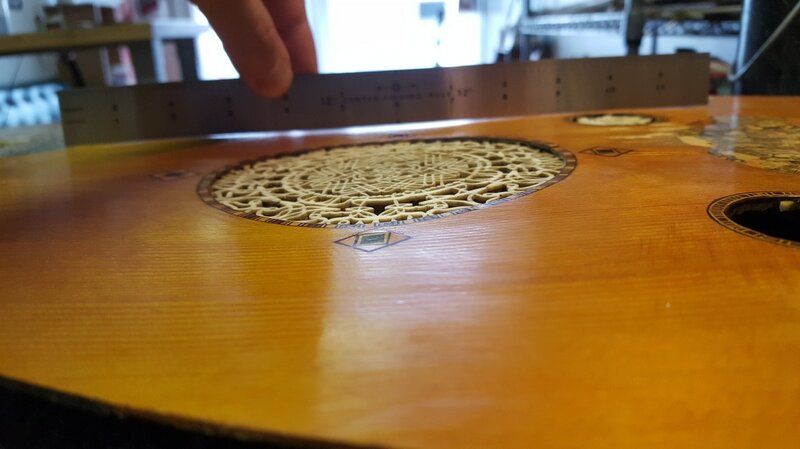 The use of ratios and combinations of angles and mastery of craftsmanship is difficult for us to reproduce even in modernity, with all the technology that has been bequeathed to us. 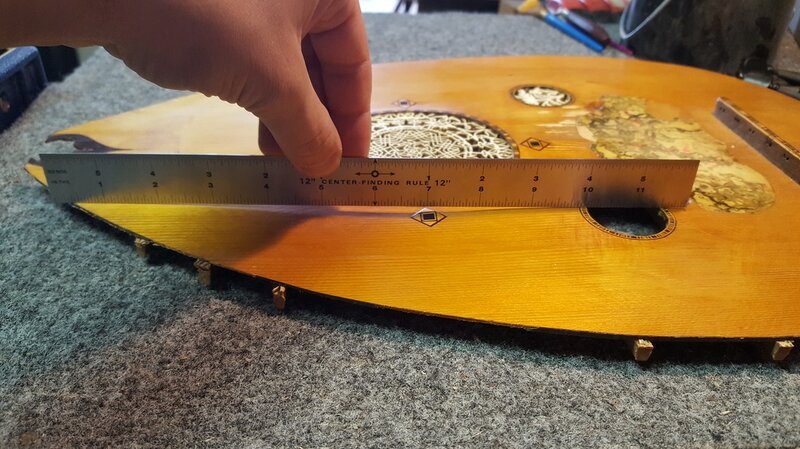 A common problem I've had in the past with repair and restoration work in general is that the client doesn't want to pay for authentic restoration work. Typically they only want to render the instrument into a functioning state. This can sometimes mean alienating certain aspects of the instrument's originality. 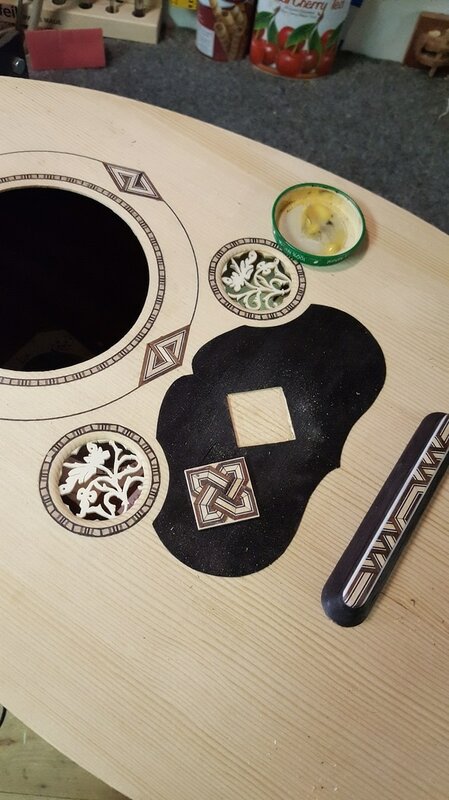 The work sometimes can be so lengthy and difficult at times more than one can possibly fathom. 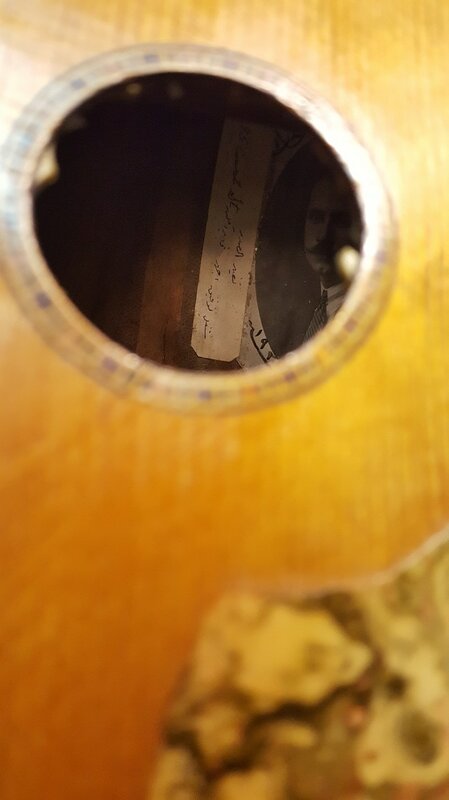 In the case of this particular oud, a 1927 Toufik Nahat which belonged to the clients father, I was given permission to do whatever necessary to bring it to a respectable state shortly after finding out the soundboard was already replaced. 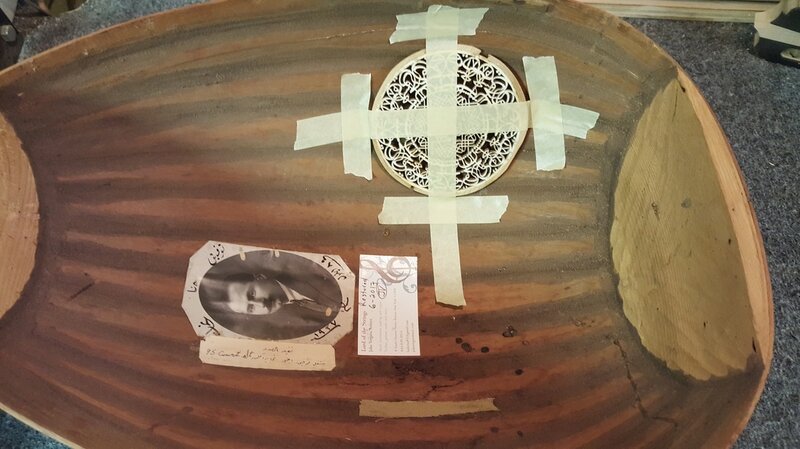 According to a small rectangular handwritten label next to the maker's label it says, "Toufiq Ajhar, soundboard replaced. 95 Court St. Brooklyn " with no date. 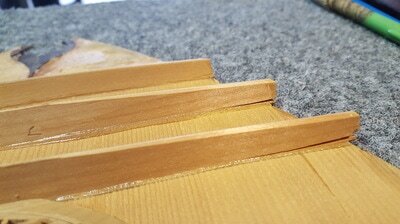 Upon further inspection the binding tiles did not match the fingerboard's binding. 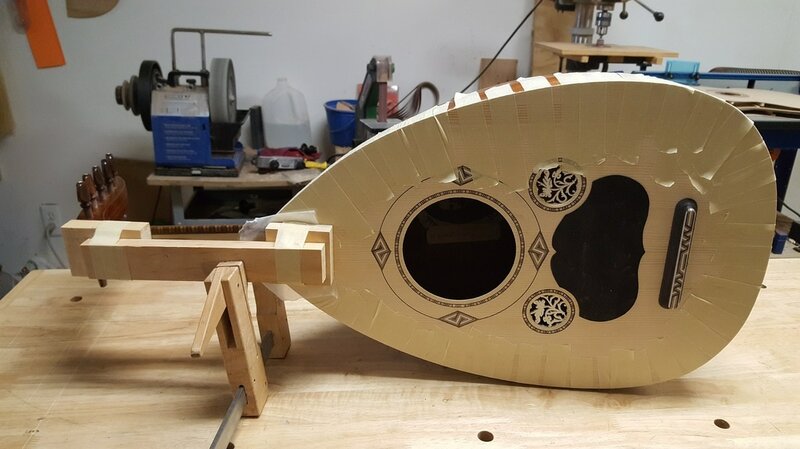 Usually the tiles should be all the same, around the soundboard and neck, sometimes around the outer edges of the pegbox walls. 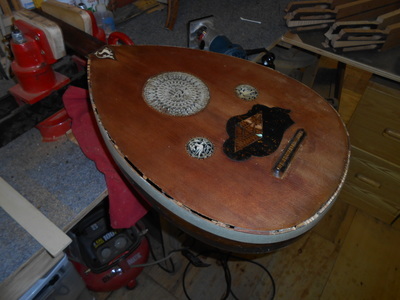 The main reasons my client brought his Nahat to me is the bad warping on the soundboard, the soundboard coming loose from the bowl, and the horrendous action. I considered repairing the warped soundboard, perhaps by removing it, rendering it more freely without the restraints of working with my hand through the narrow soundhole. 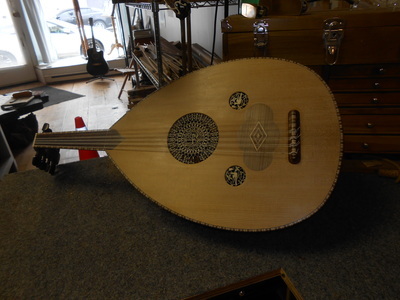 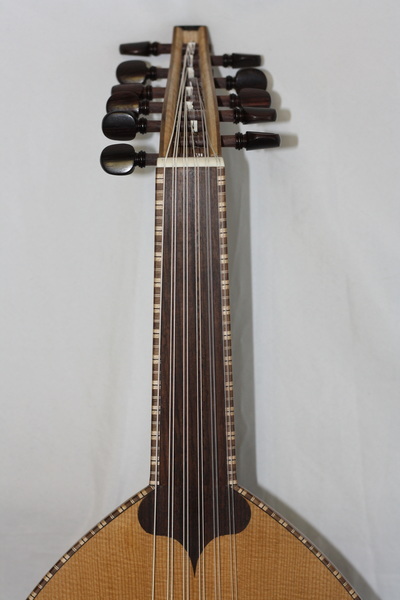 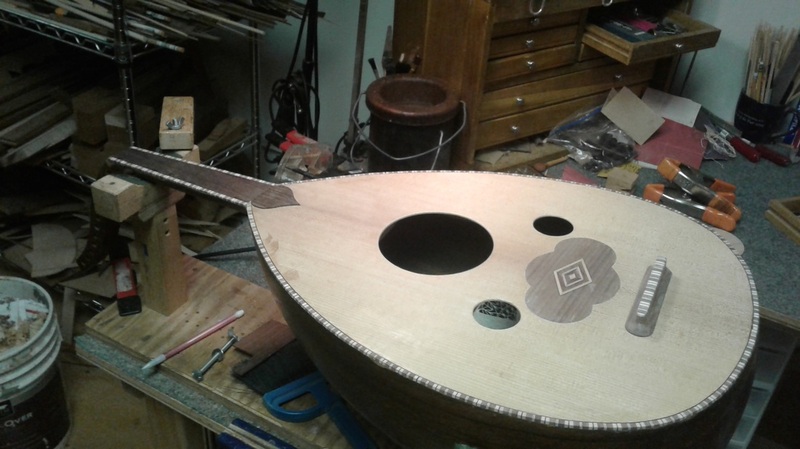 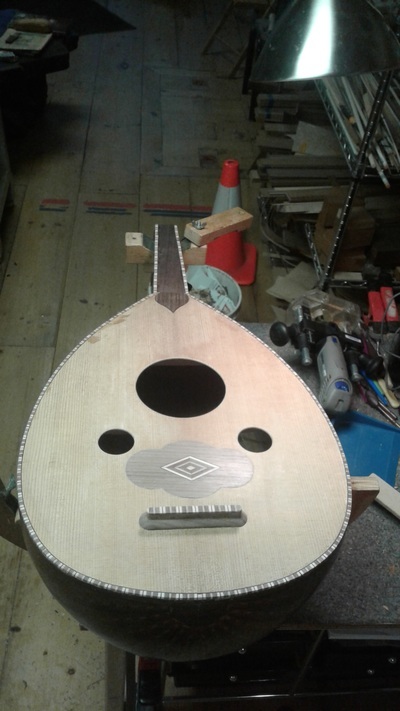 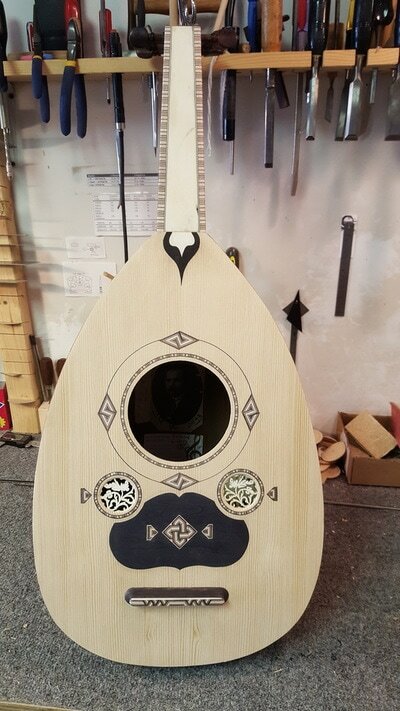 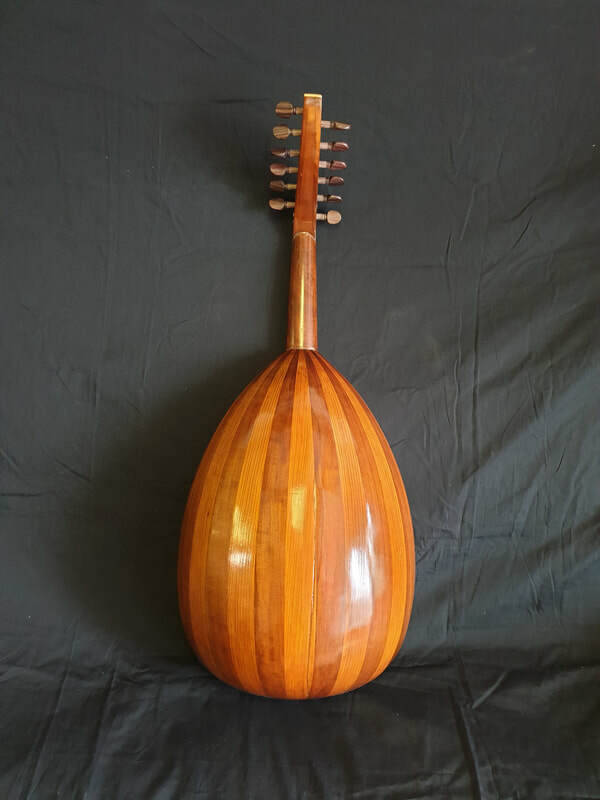 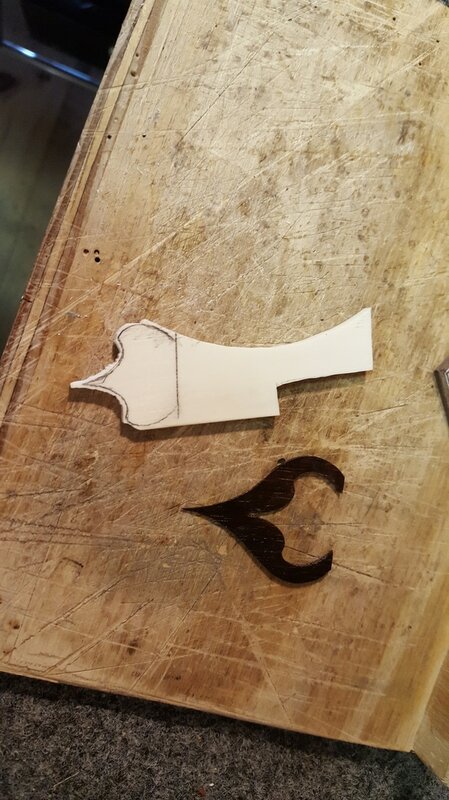 I planned on routing off all the unoriginal binding tiles from around the soundboard to remove it with more ease, execute the soundboard repair, then copy the pattern of binding tiles from around the fingerboard (which are original) and so I would have made the oud slightly more authentic. Upon removing the soundboard I can see why it failed and was collapsing in on itself. 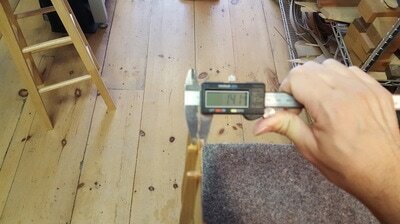 First off the board was thicknessed too thin, being 9mm in some areas, not even a full millimeter and roughly half the thicknesses under spec. 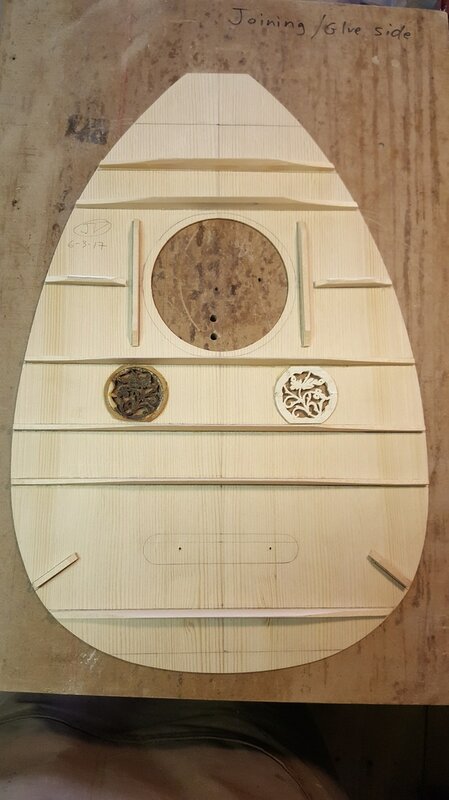 Additionally the unoriginal soundboard was lacking the necessary 2x vertical braces adjacent to the soundhole where it was also ultra thin. At that point it was obvious to me that it would be foolish spending time and money repairing this soundboard and that it should be replaced. 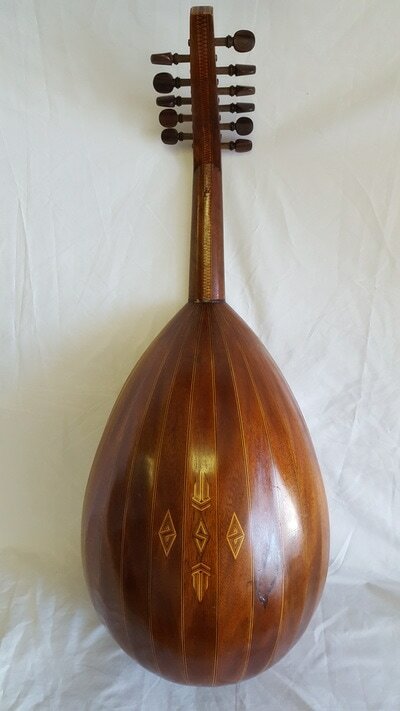 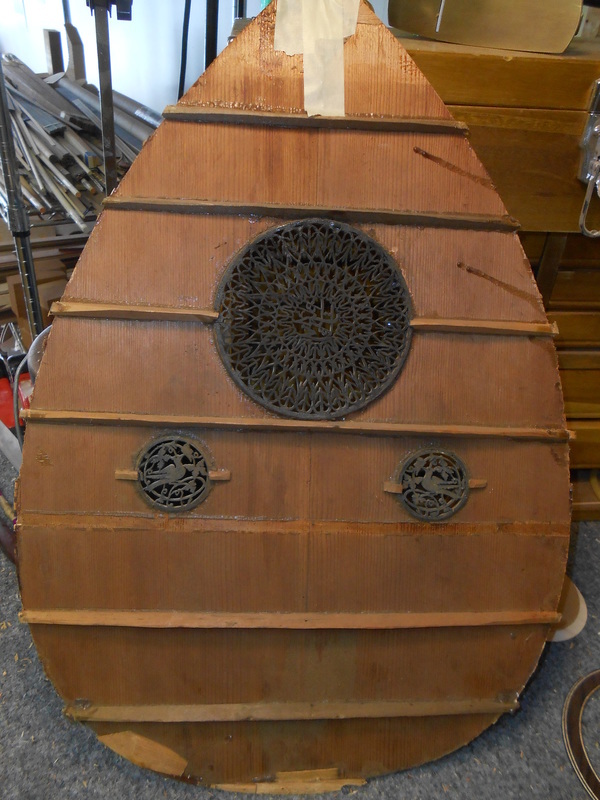 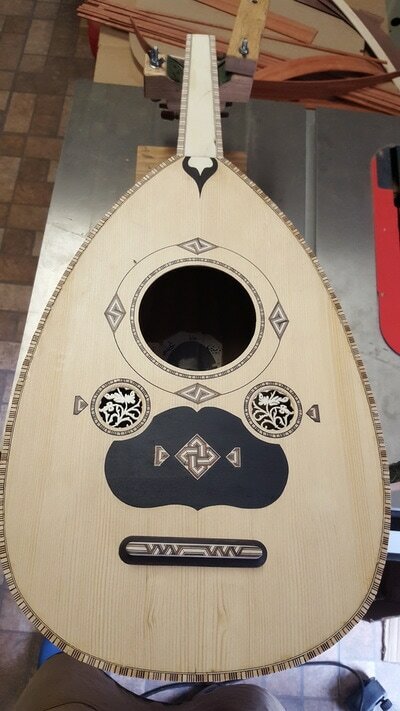 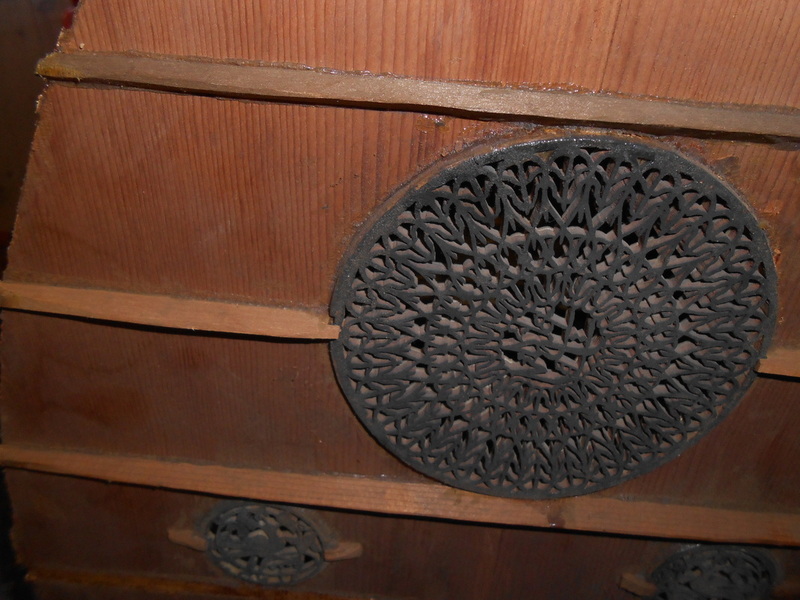 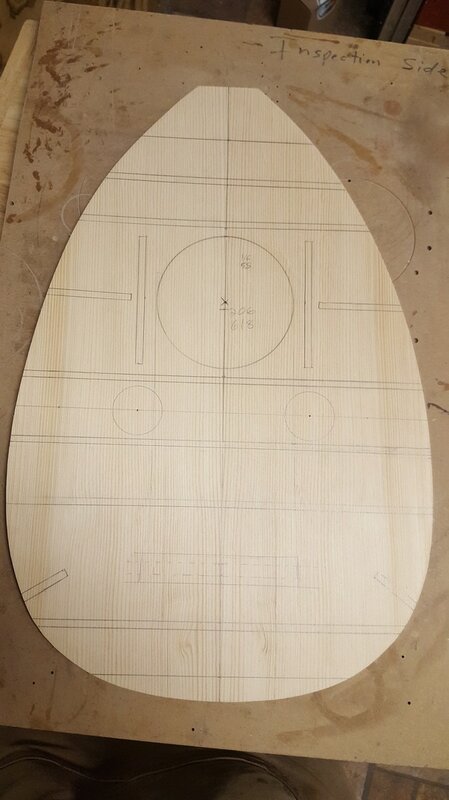 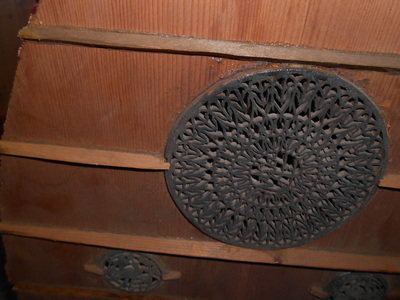 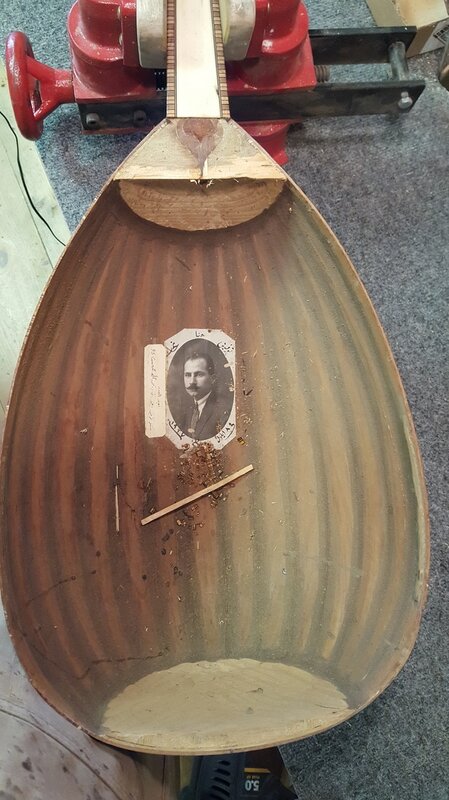 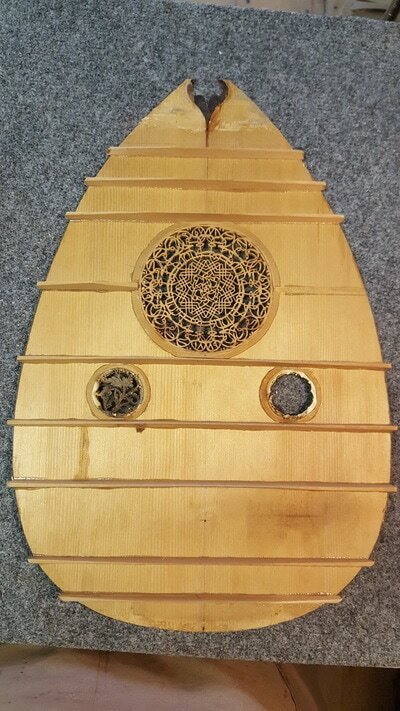 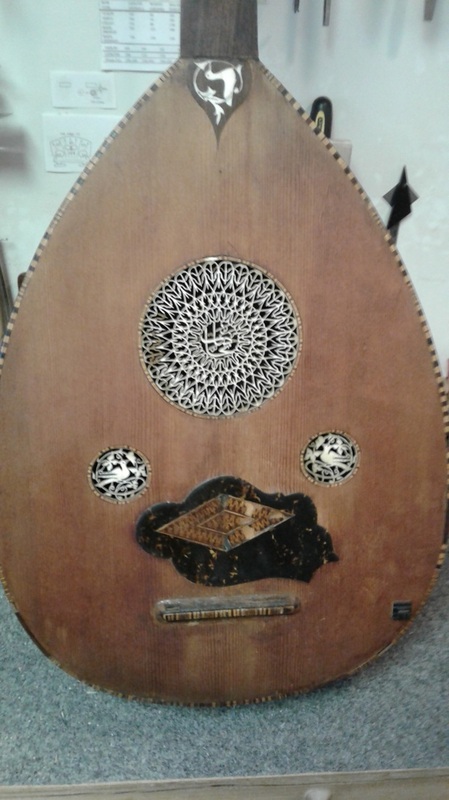 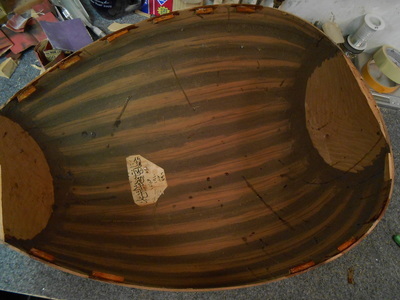 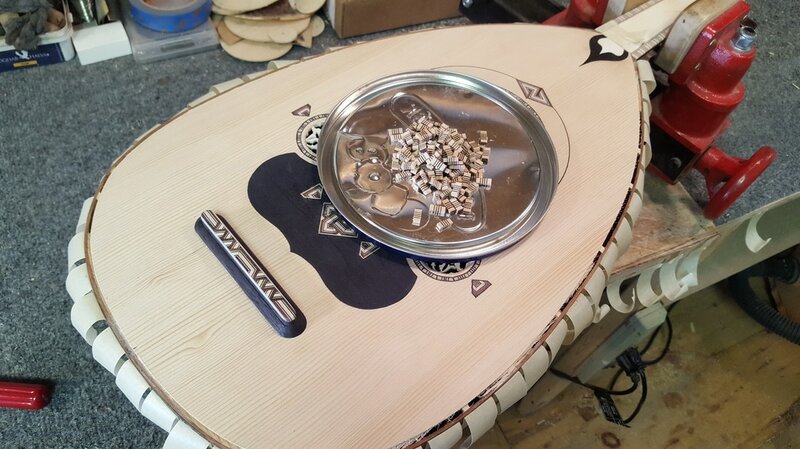 I called my client to share some photos and talk about the idea of not only replacing the soundboard (which his father put many miles on) but do an authentic Nahat style soundboard, complete with motifs copied from the bowl and in a style very much known from original Nahat soundboards that have survived. 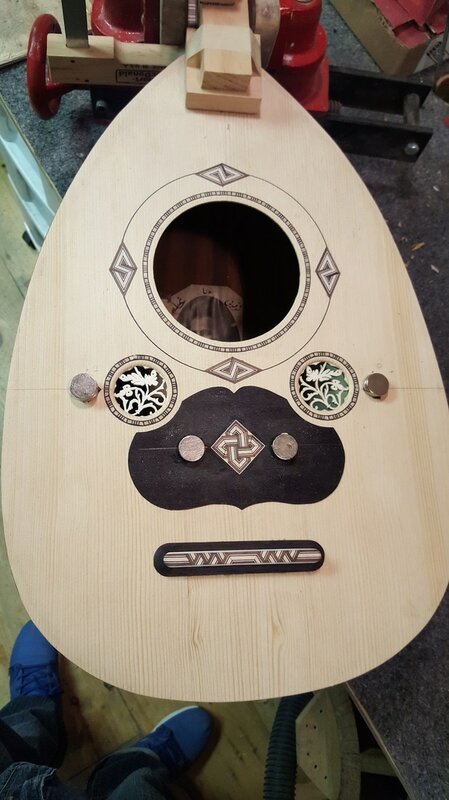 My client was surprised the soundboard was replaced and said it would have had to been done long before his memory could serve him, and quickly agreed to having the soundboard replaced to Nahat parameters. 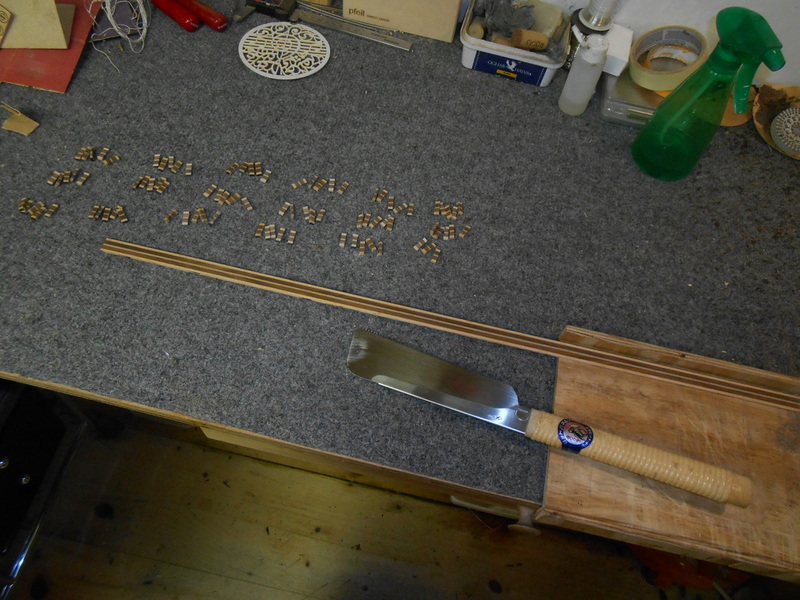 After clearing some outstanding tasks from my work bench, I began plotting my path with the Nahat project. 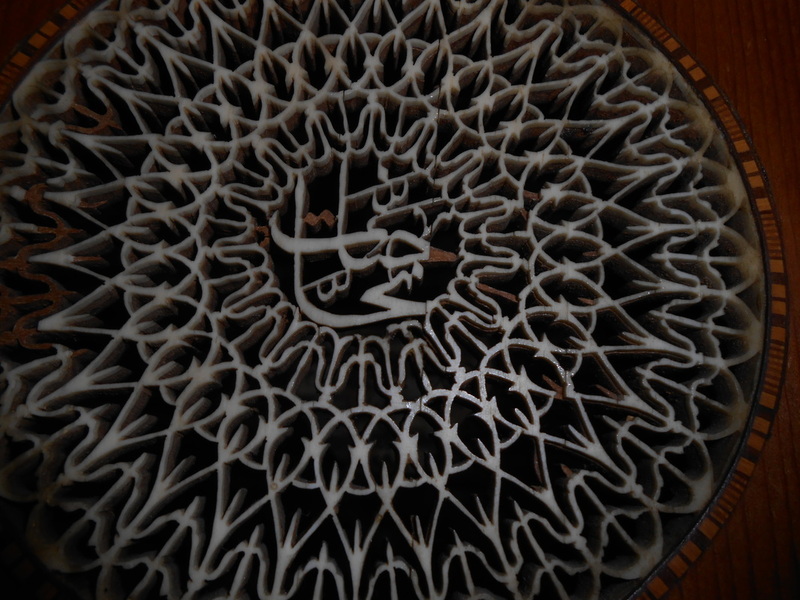 I became obsessed thinking about the details and how it would turn out in the end. 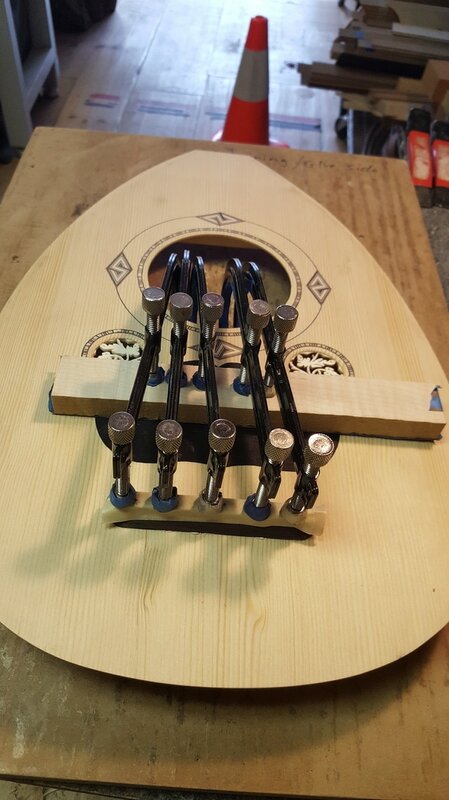 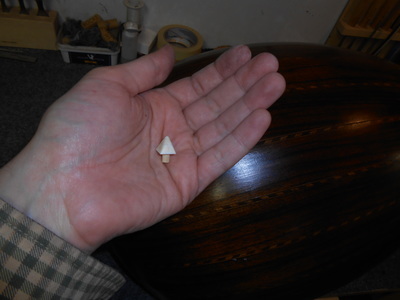 I began by choosing some aged turkish Spruce a friend had given me, from a board I had good luck with the sound in the past. 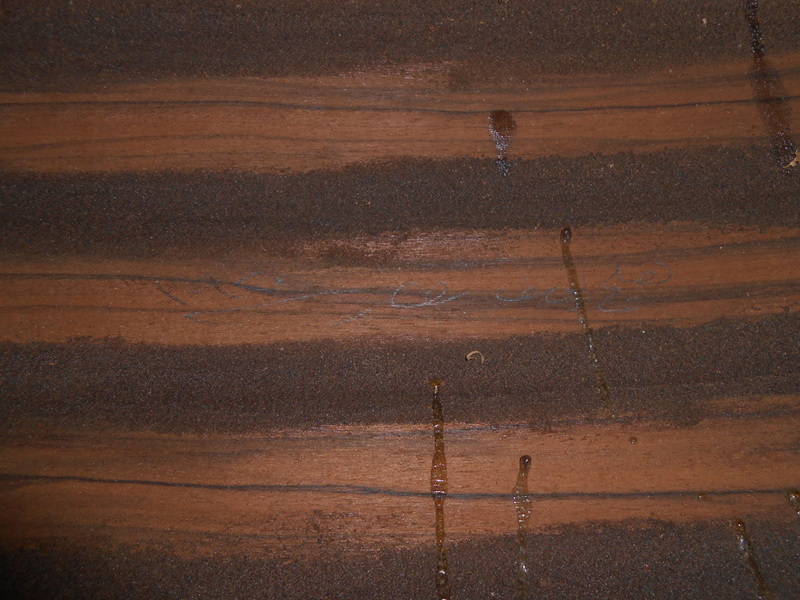 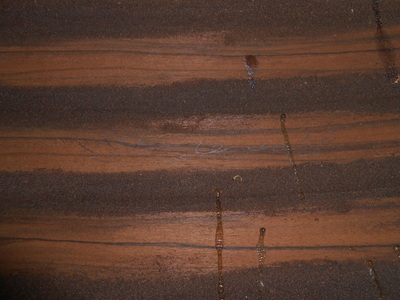 The wood's appearance would be commonly seen on an original Nahat oud; medium to wide grain, wavy grain pattern. 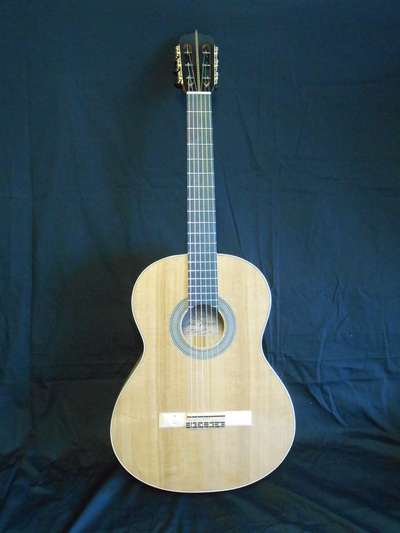 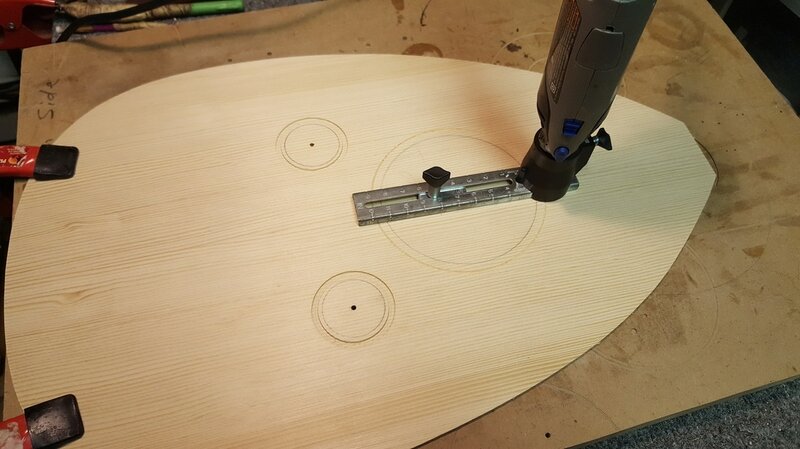 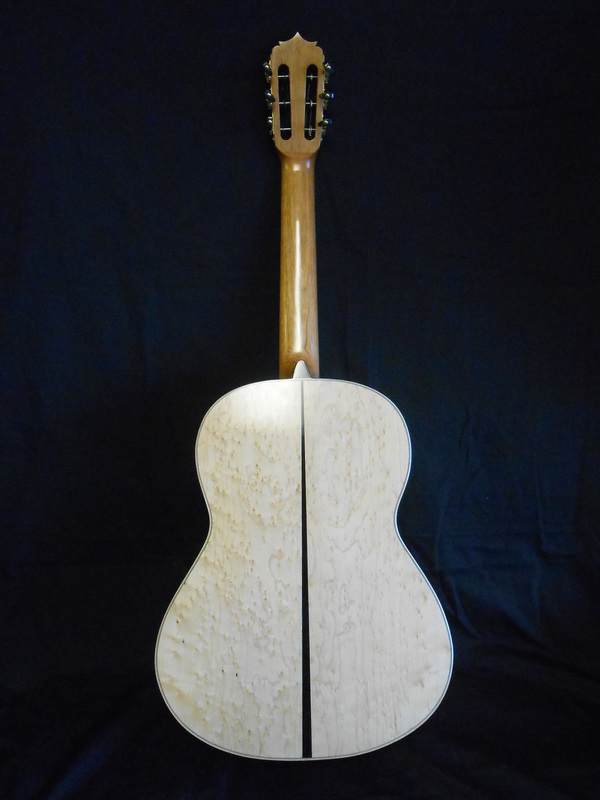 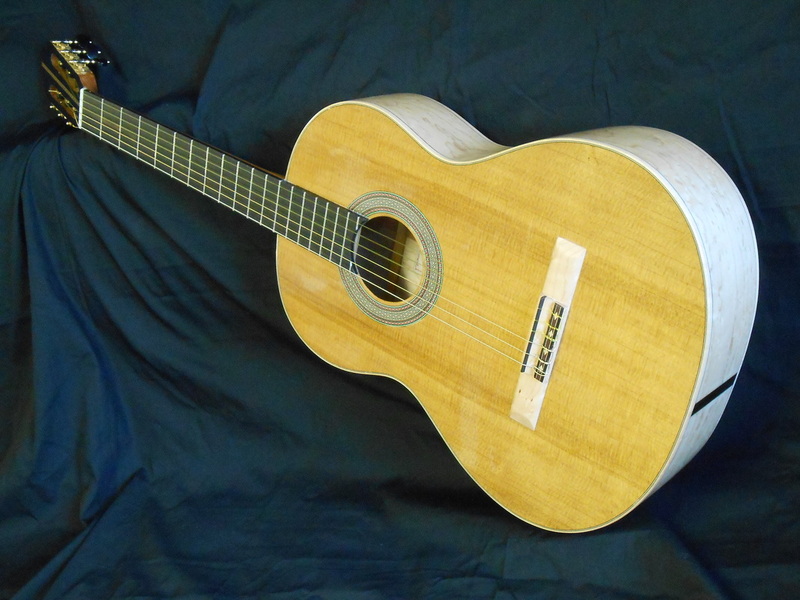 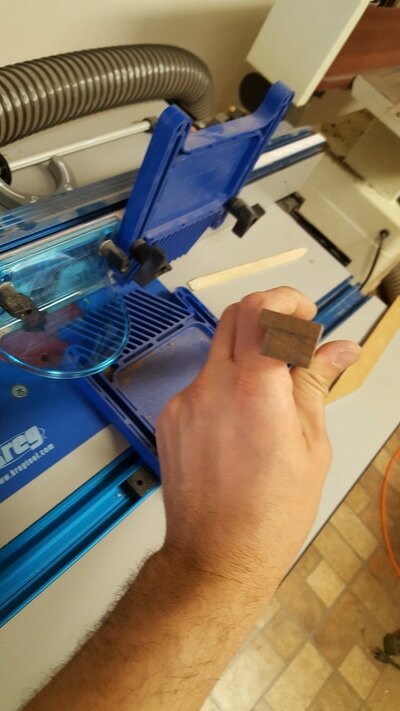 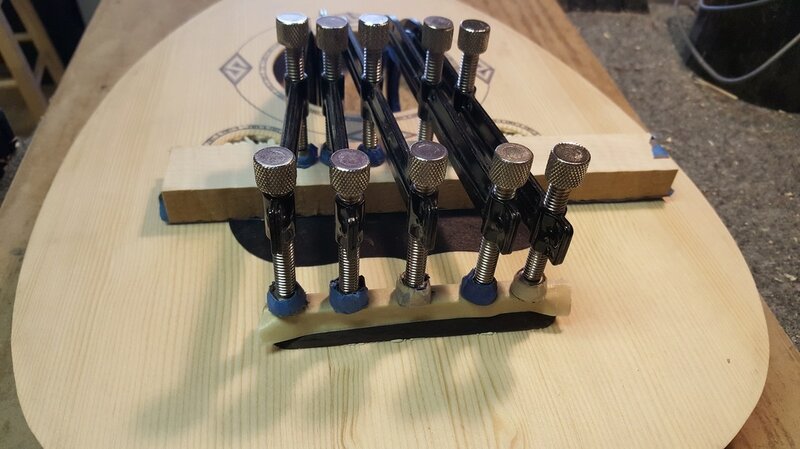 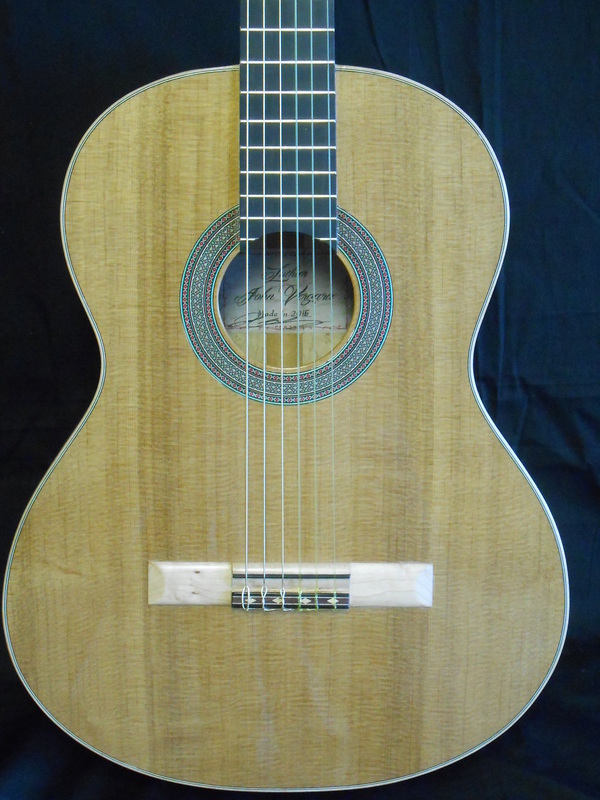 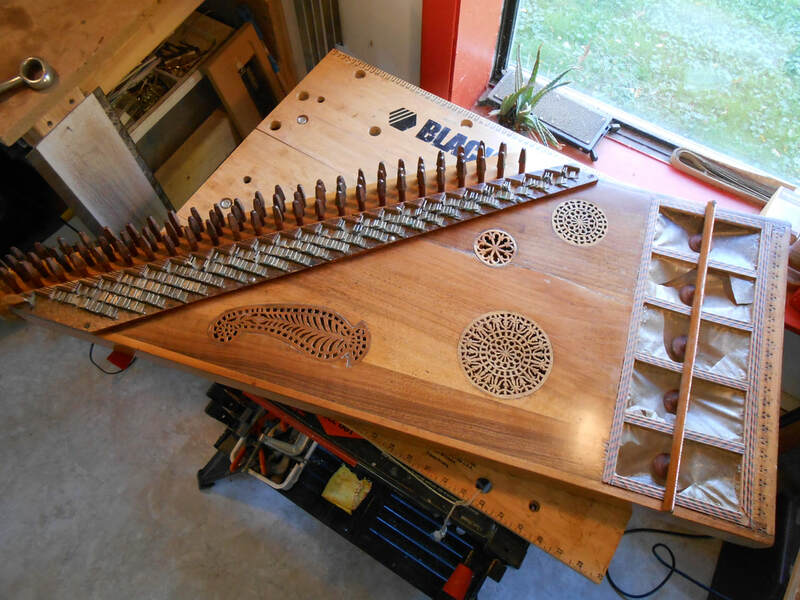 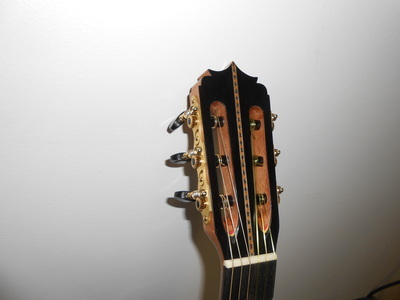 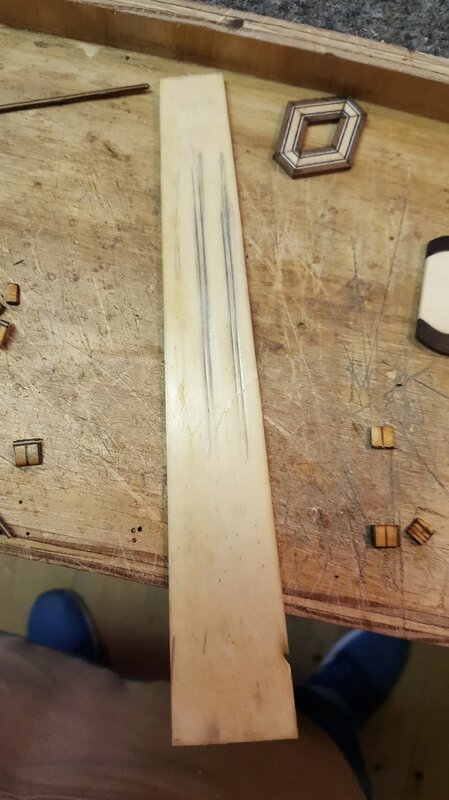 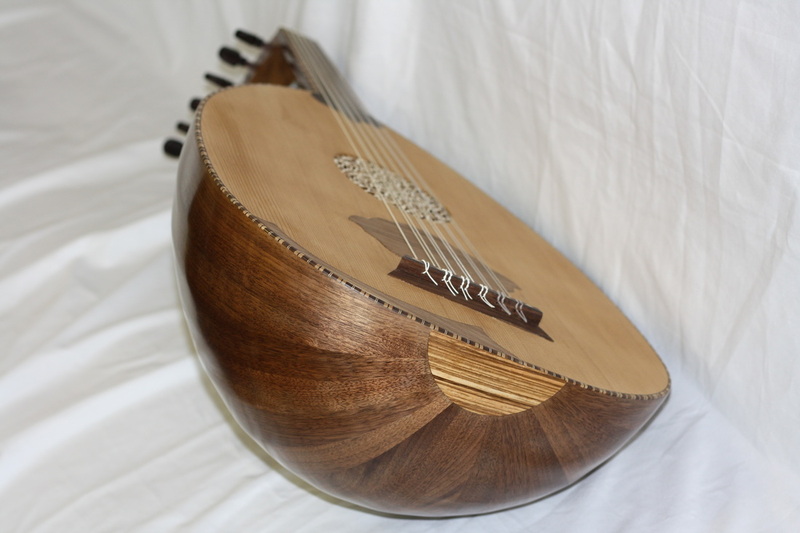 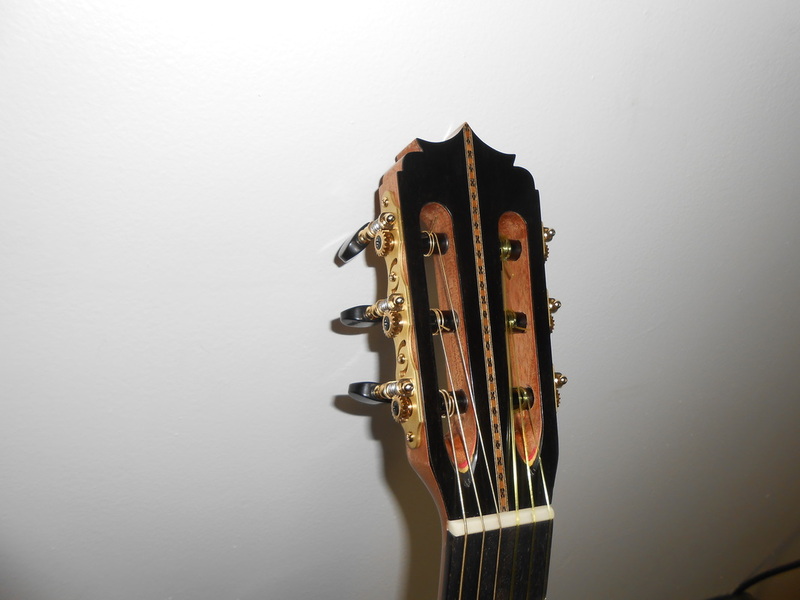 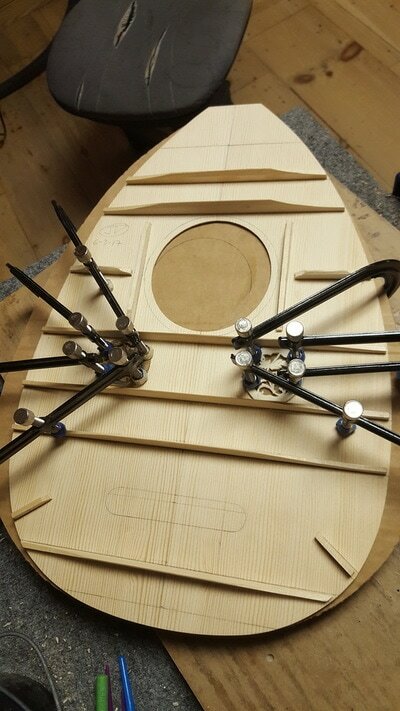 I would have to copy the binding around the fingerboard to complete the soundboard and I would copy one of the diamond S pattern from the back of the bowl to inlay into the soundboard. 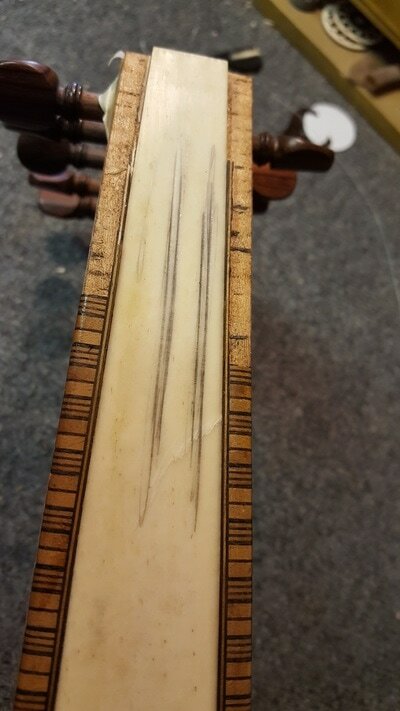 The pattern around the fingerboard consists of various sandwiched strips of veneers varying in color to produce the pattern. 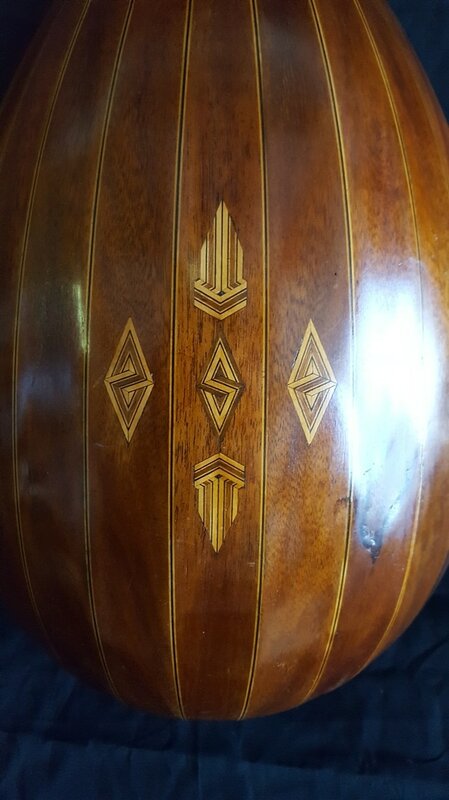 The same was done with the motif on the bowl. 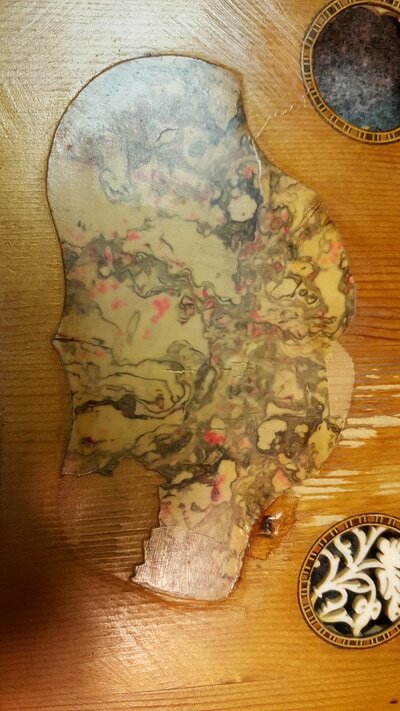 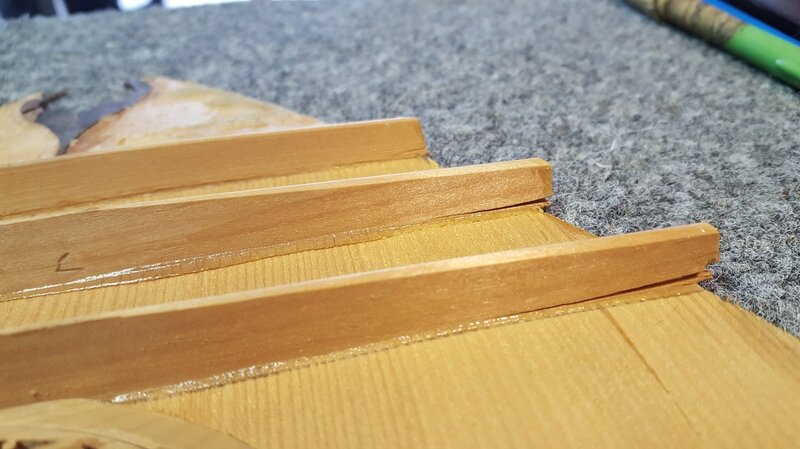 The veneers are thicknessed to the correct dimensions then glued together and left to sit for two days to dry. 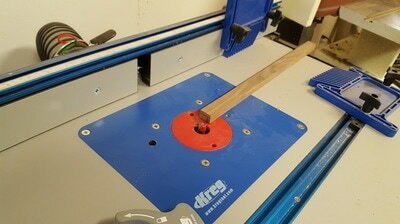 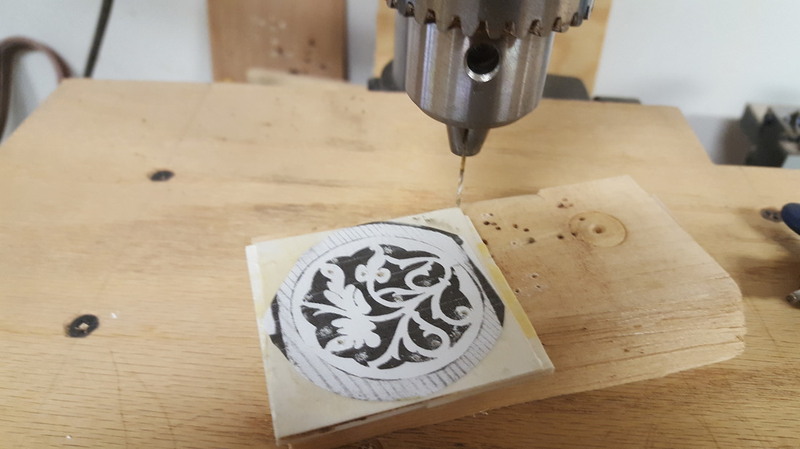 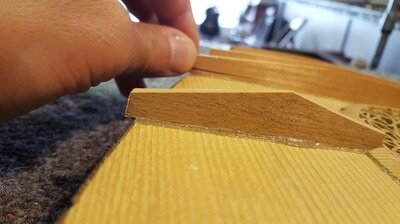 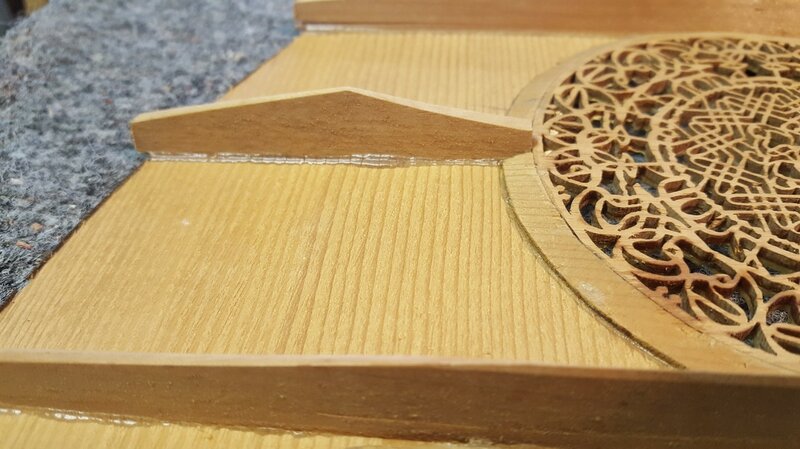 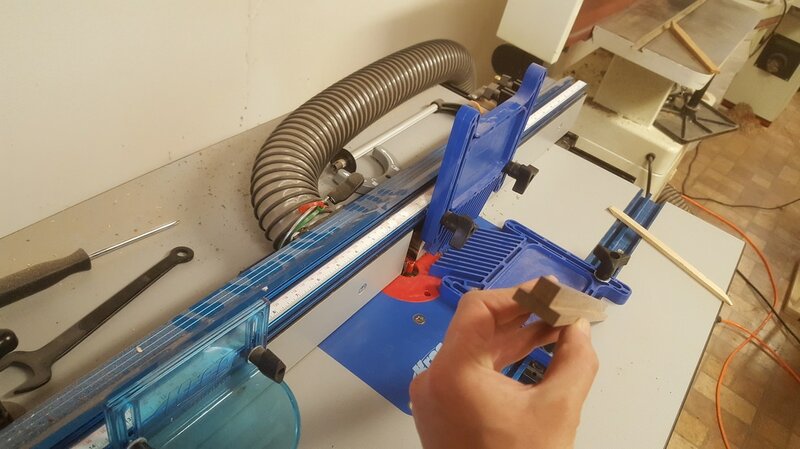 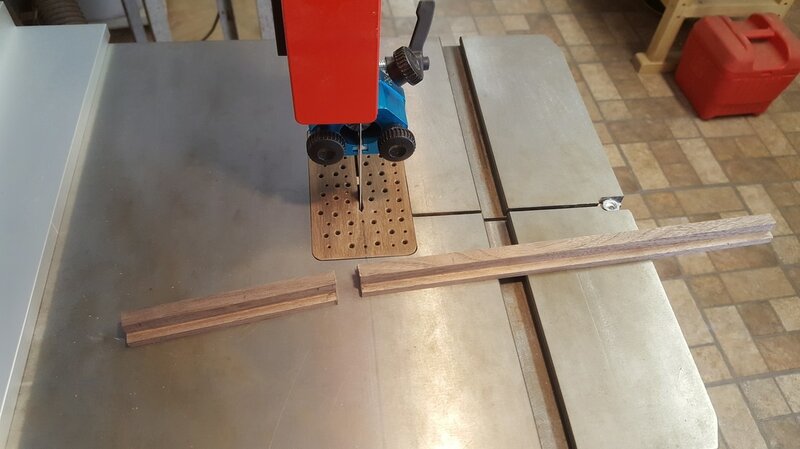 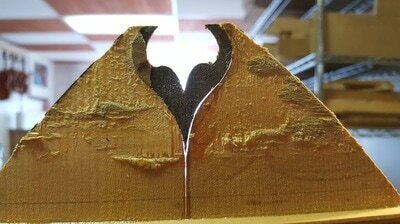 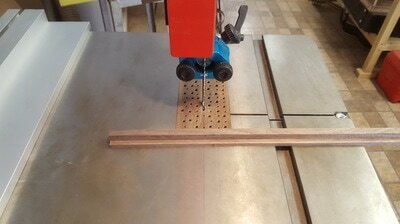 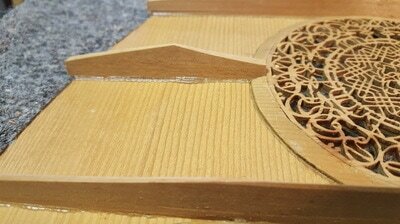 Once dry, the edges can be cleaned up of glue squeeze out, cut along its edge into strips which are fit into a custom made mitre box which the various angles are built in for a fine saw to cut the strip into pieces that forms edge binding or inlay mosaics. 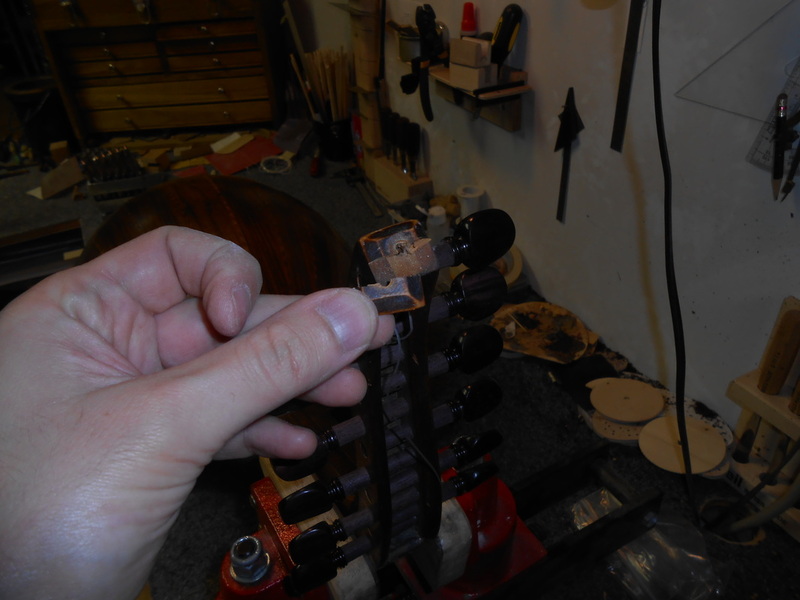 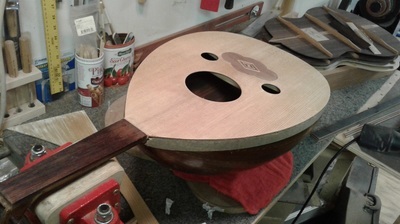 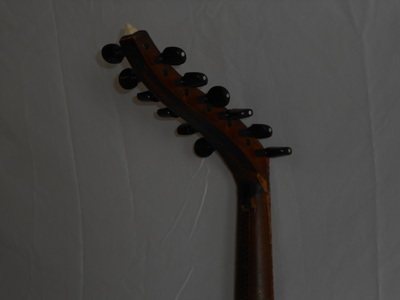 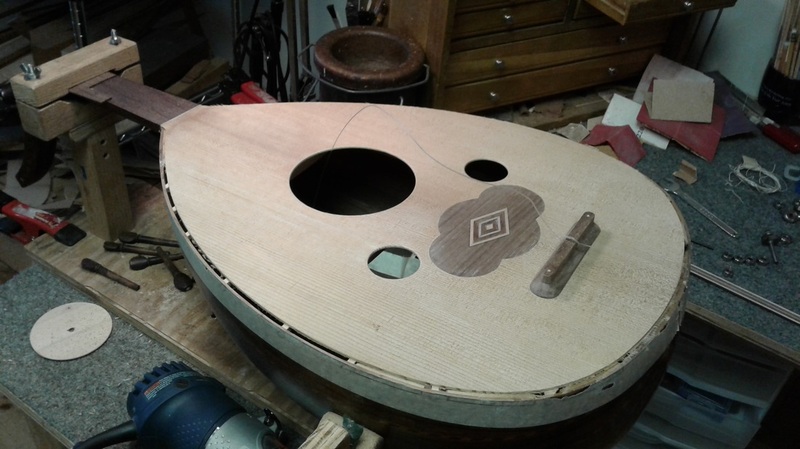 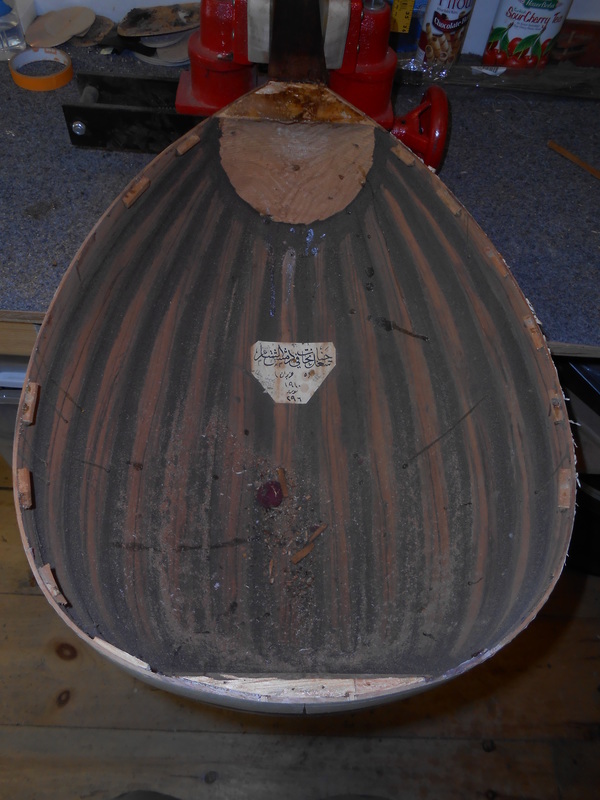 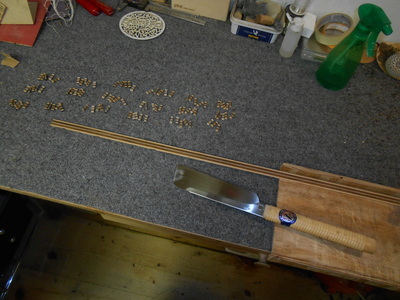 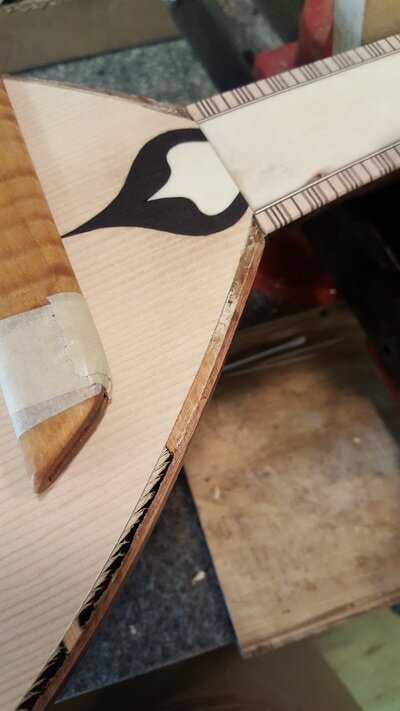 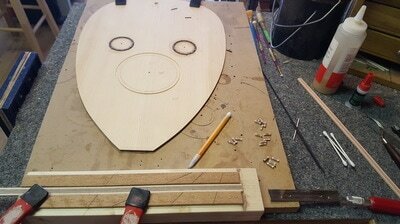 The soundboard was joined and the braces thicknessed, located and shape to previous Nahat specifications; a critical measure for an authentic Nahat sound. 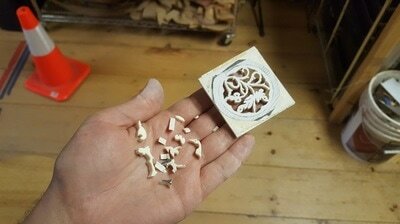 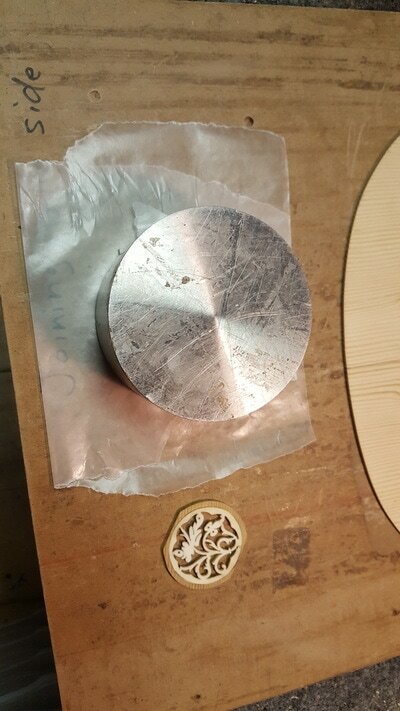 One of the small bone rosettes were completely missing so I had to reproduce a matching replica. 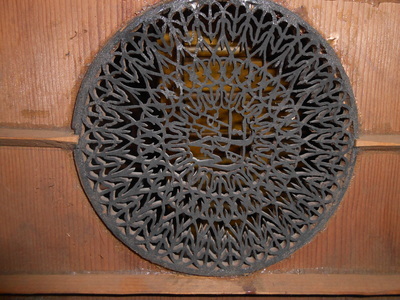 The other rosettes were removed, cleaned up and performed minor repairs on them. 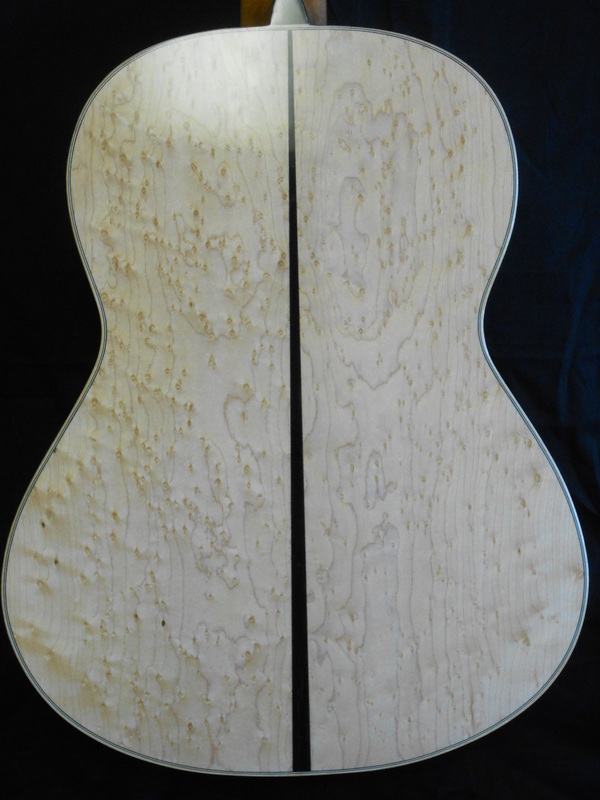 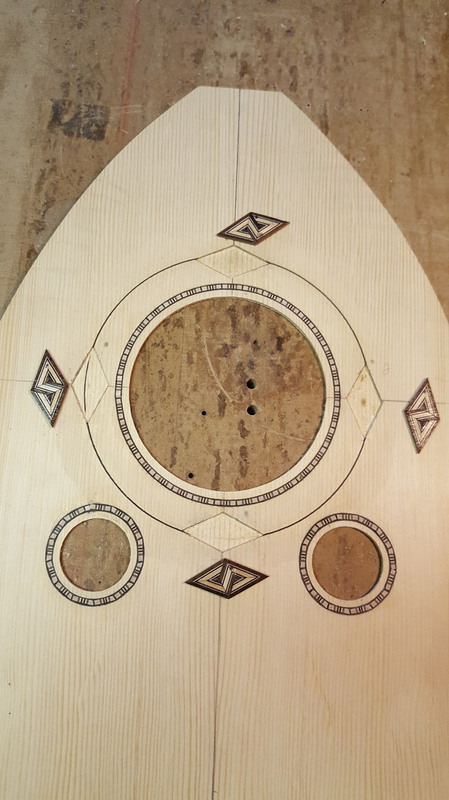 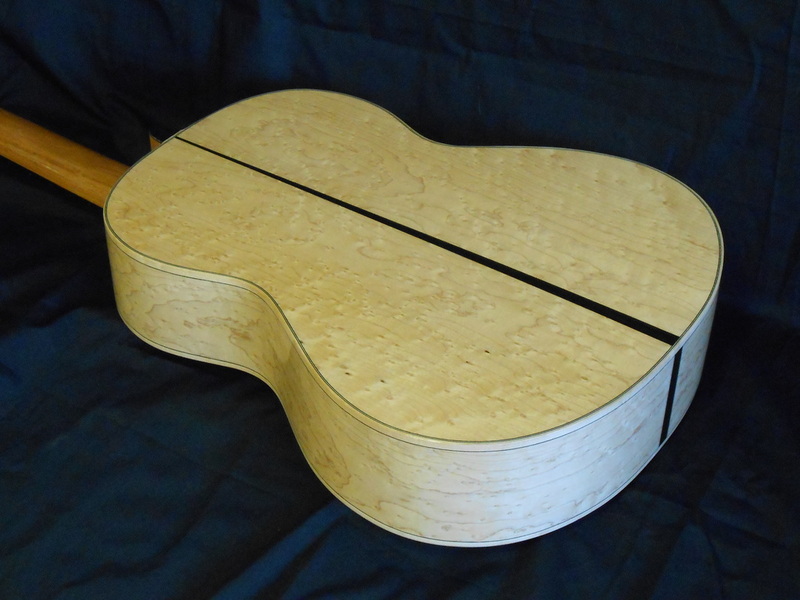 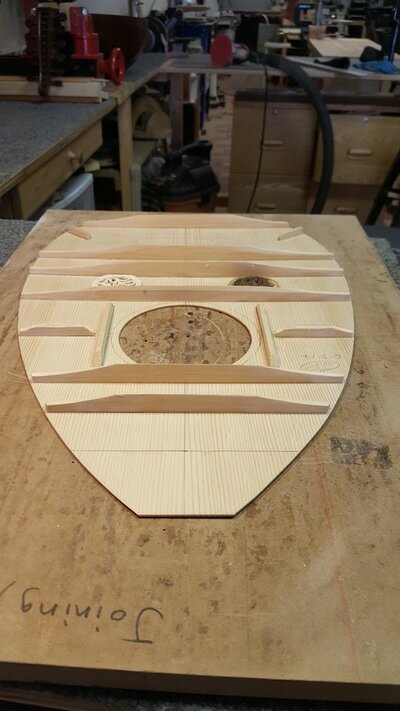 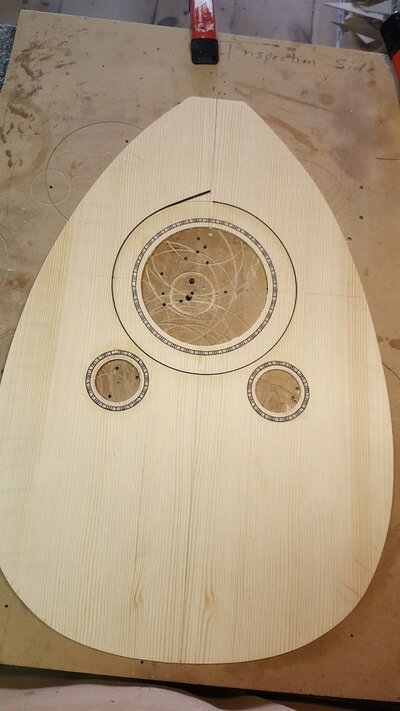 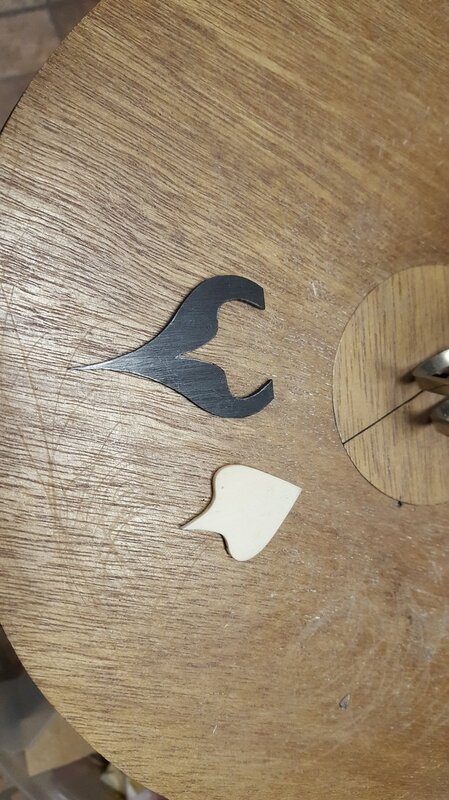 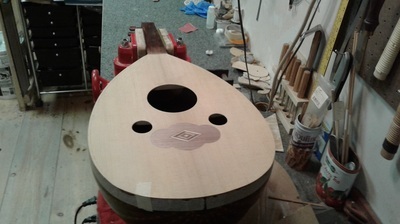 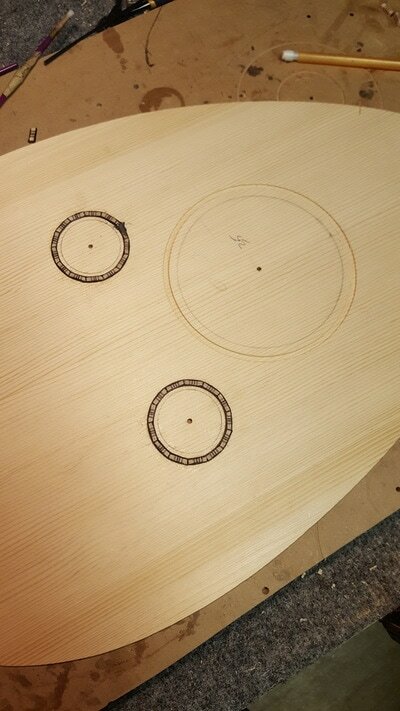 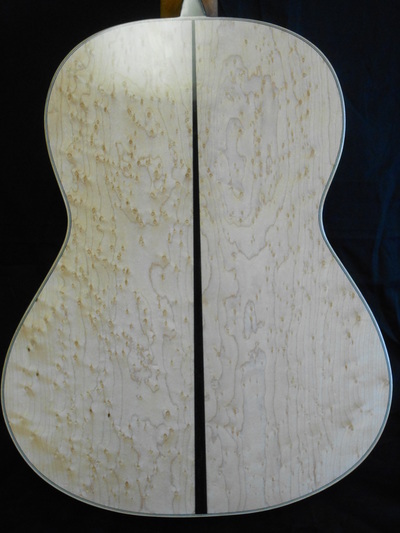 Four diamond S shaped inlays were made and inlaid into the soundboard around the soundhole on top of a black purfling which encircles the main soundhole. 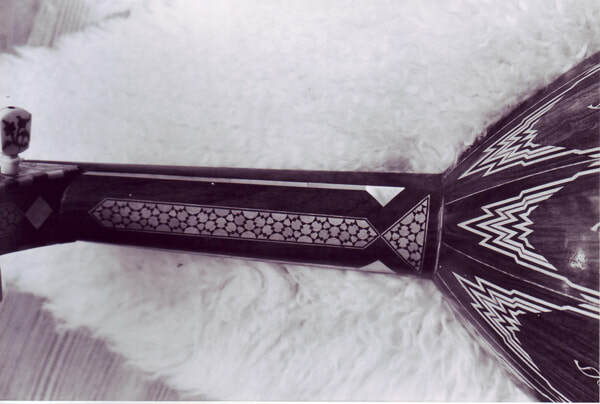 The pickguard was fashioned from black veneer using a classic Nahat pattern. 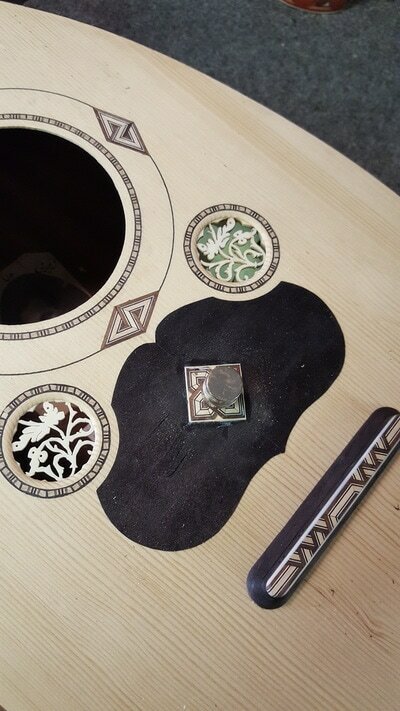 Binding tiles were also inlaid around all 3 of the soundholes from the copied pattern on the fingerboard. 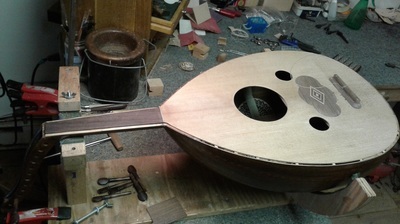 The neck needed serious reworking as the action was another serious issue. It was reset with the soundboard off, and 2x additional 3/8ths hardwood dowels were installed through the neck block into the neck to add additional strength to the neck. 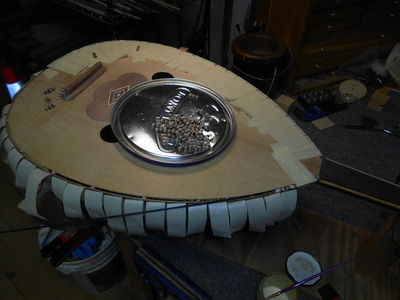 The soundboard was installed, pickguard glued on, and 3 additional Nahat style inlays would be added. 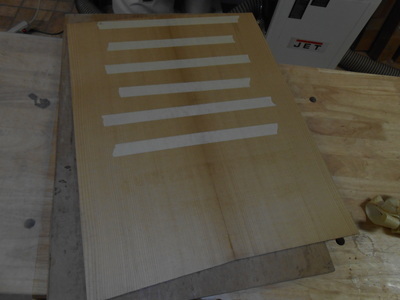 I made a new bridge because the bridge on the soundboard was not in the Nahat style. 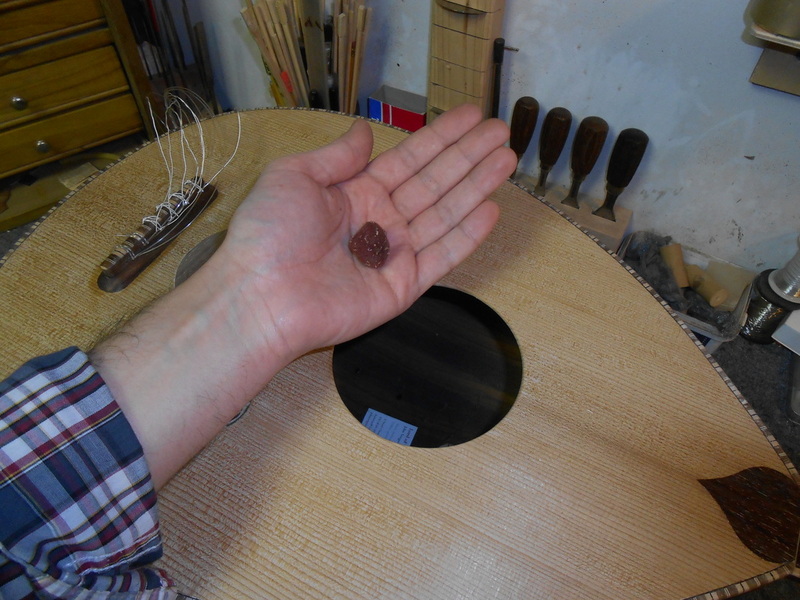 The bridge was fashioned from walnut, dyed black and a decorative mosaic cap joined to the top. The rosettes installed, along with the binding. 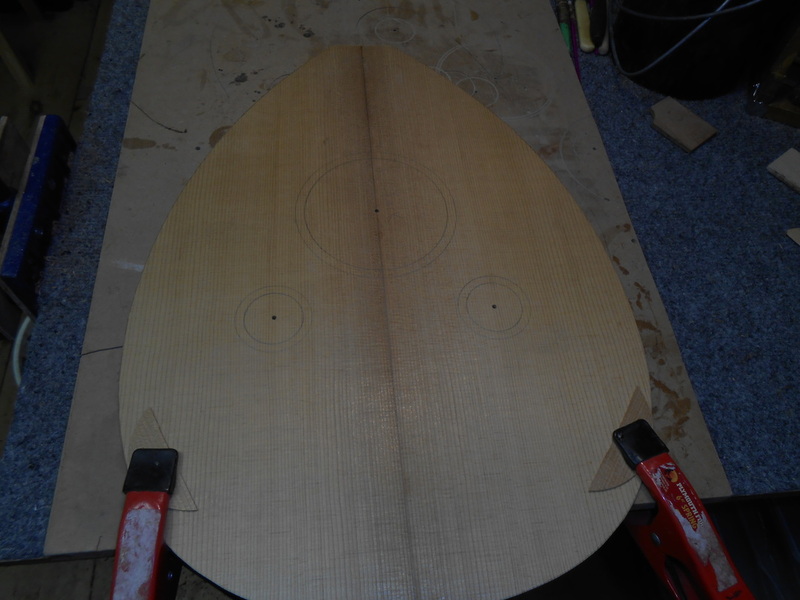 The action came down significantly however I wasn't entirely please and performed a second reset from the top of the soundboard and landed a very comfortable low action which should be very future proof considering 2 dowels were added from the inside prior to the installation of the soundboard. After installing the strings I was very satisfied with the rich sweet Arabic tone we all search for. The use of quality wood and an aged bowl should be the main reasons for this. ​In general I wish most of my clients would be more understanding about the amount of work it takes to do a proper restoration. Many can't afford it as well which is a part of the reason you see many antique instruments butchered and stripped of their authenticity. I recently took the stance of doing restoration work as original as possible. Some say it wouldn't matter, but to me, it does. 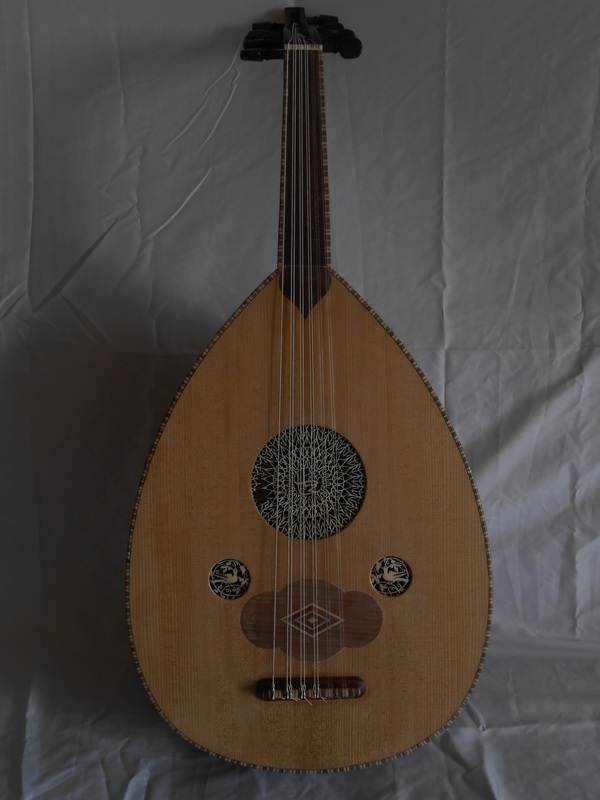 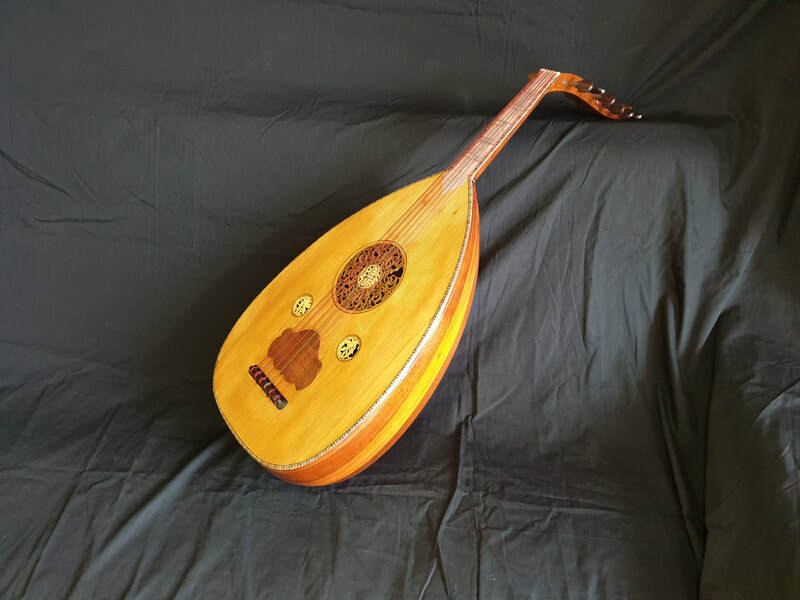 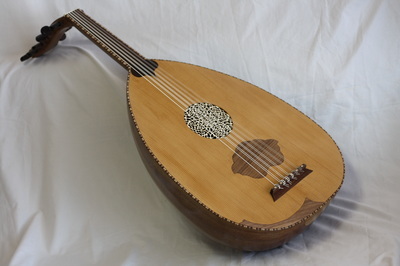 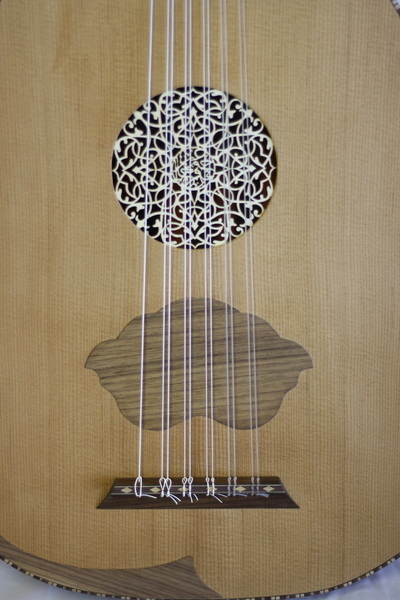 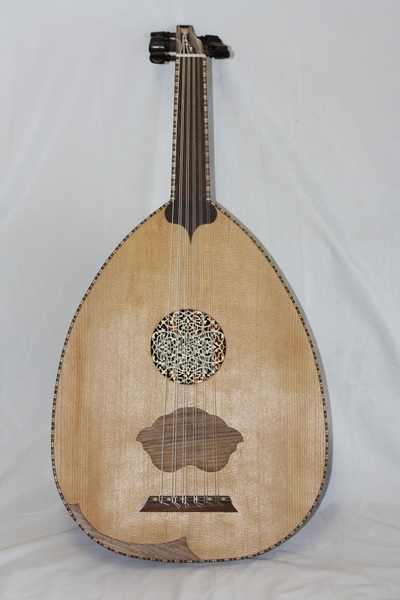 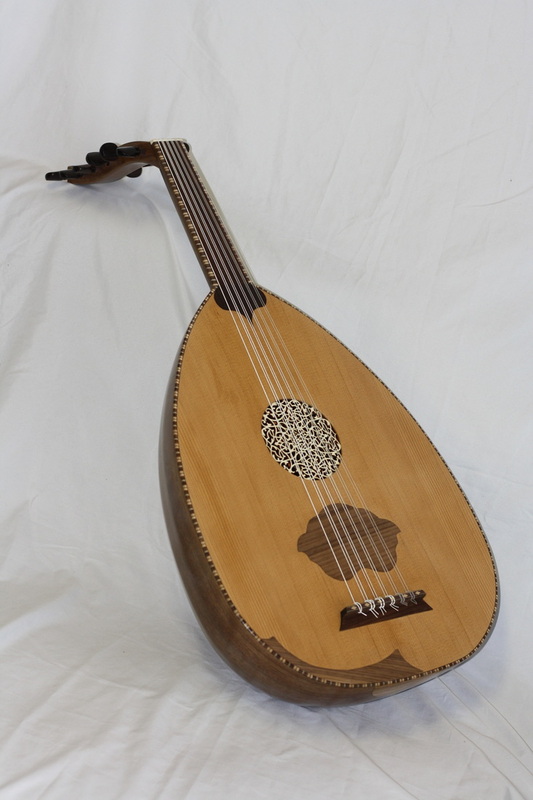 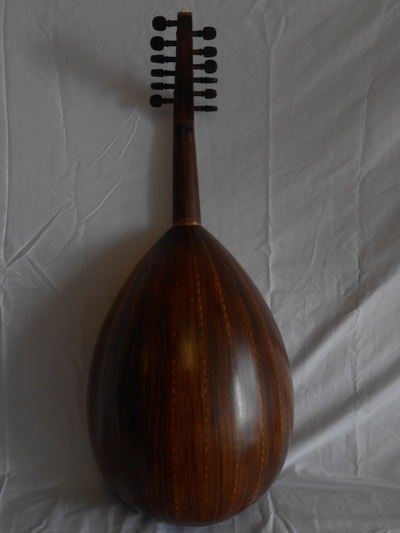 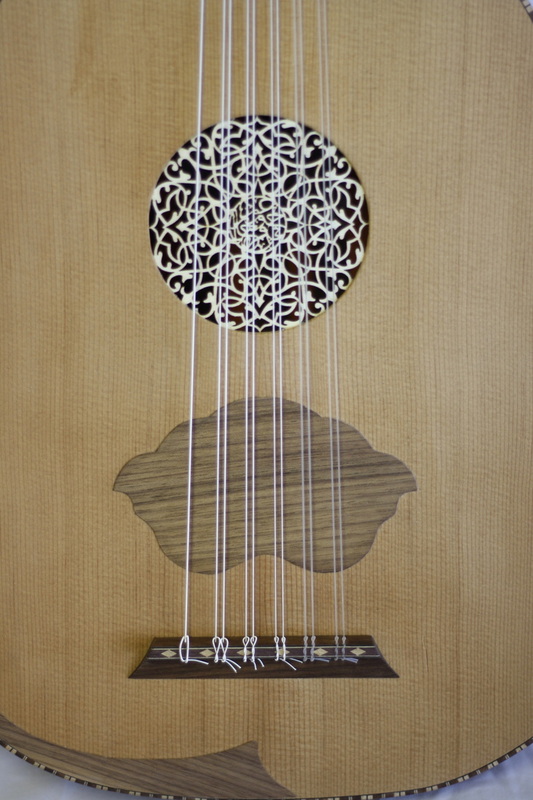 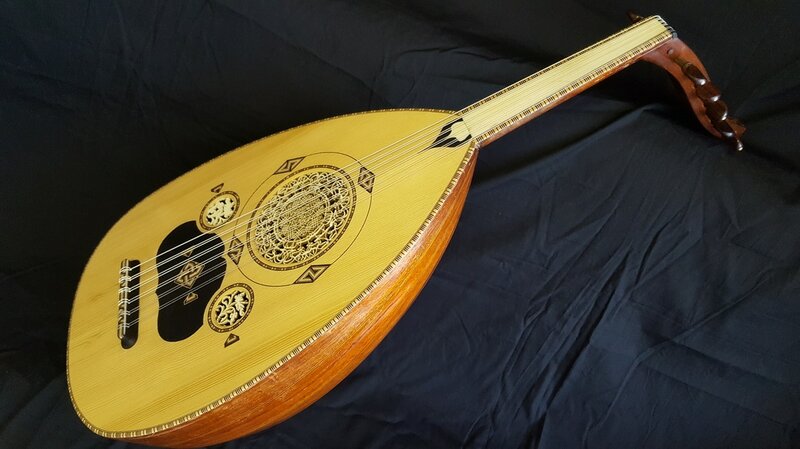 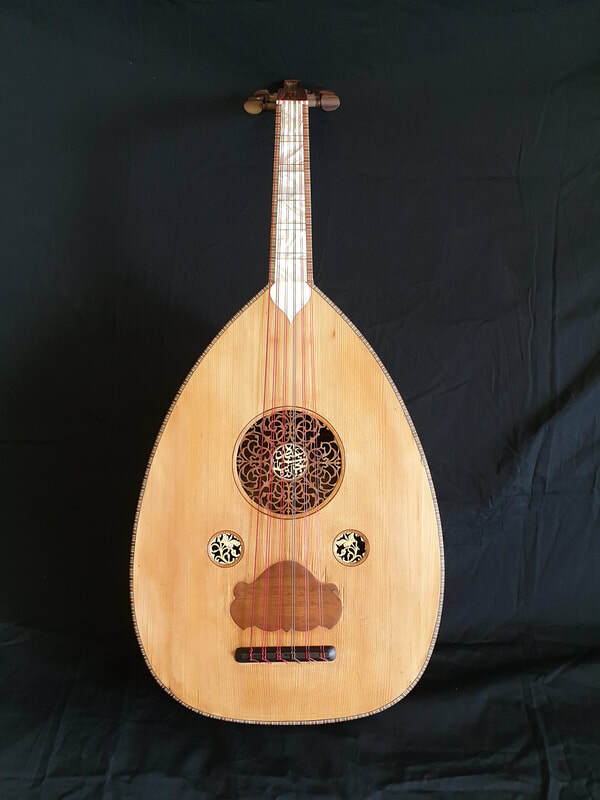 ​Many people have issues on the oud with "buzzing". 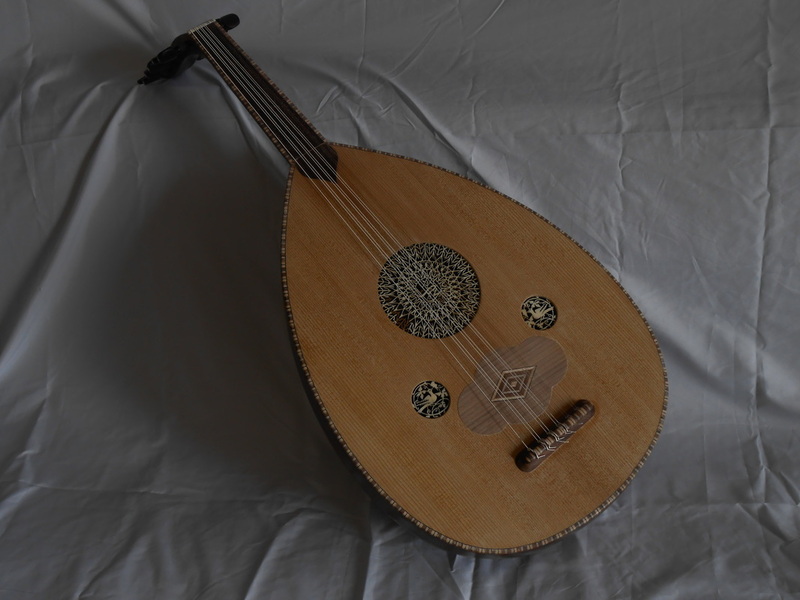 I hope this video sheds light and demystifies issues with buzzing on the oud.